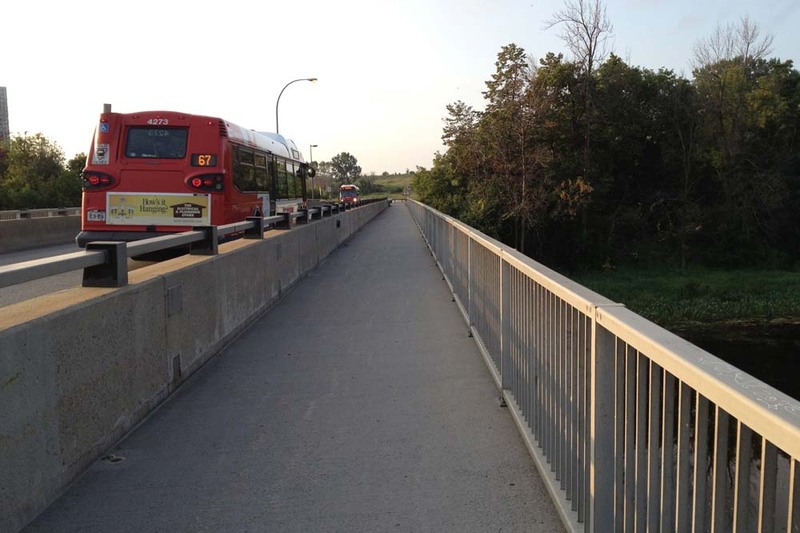 Someone recently asked via Twitter if there is a safe way to bike from Parliament Hill to the Ottawa Hospital General Campus that avoids the ‘horrible Smyth Road bridge’. 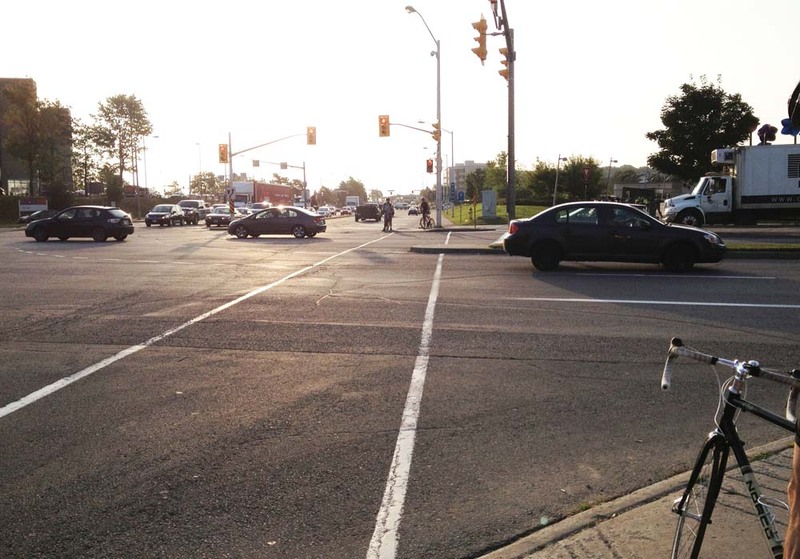 I’ve been meaning to post a route for commuters biking to and from Ottawa South that avoids Main Street as much as possible, at least until they’ve finished the Main Street – Complete Street renewal. So here is a route indicated by the blue line on the map below, starting at Parliament Hill to the Ottawa Hospital General Campus and beyond through the rest of Ottawa South. The green line on the map is a slightly different section taken on the way back to avoid crazy Lees Avenue, because it doesn’t have a bike lane heading west. UPDATE – Spring 2016: An important link along this route, the bike path along the transit bridge over the Rideau River, is closed for LRT construction Until January 2018. An alternative route around this construction site is described in this more recent post. 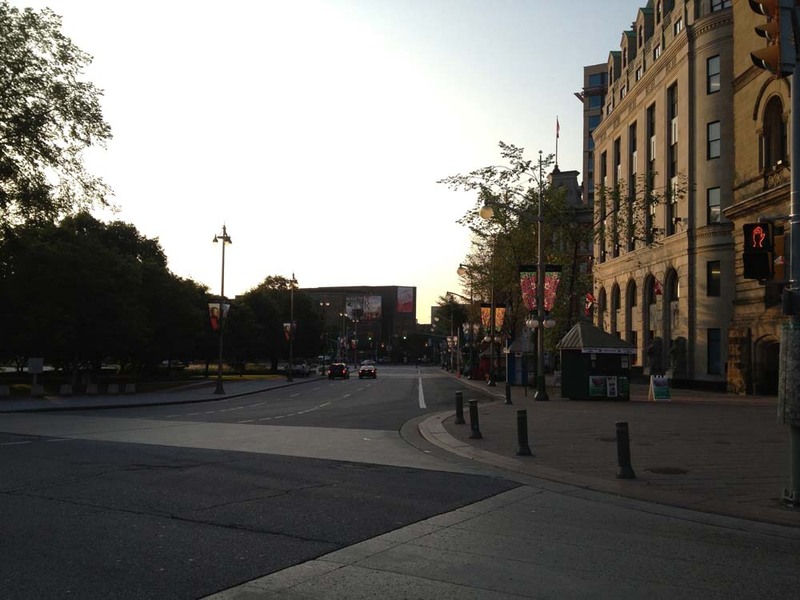 Leave Parliament Hill, cross Wellington and head a short distance down Elgin Street. 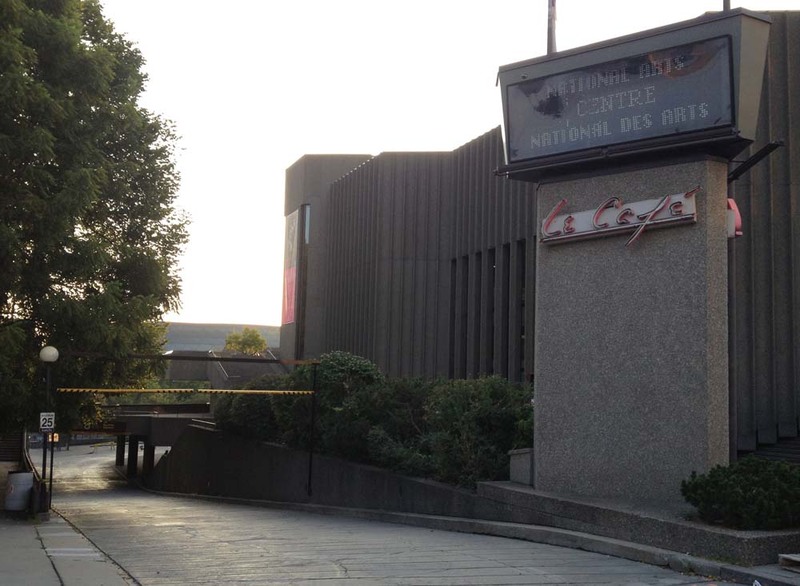 Turn down the ramp beside the NAC across for the War Memorial, like so. 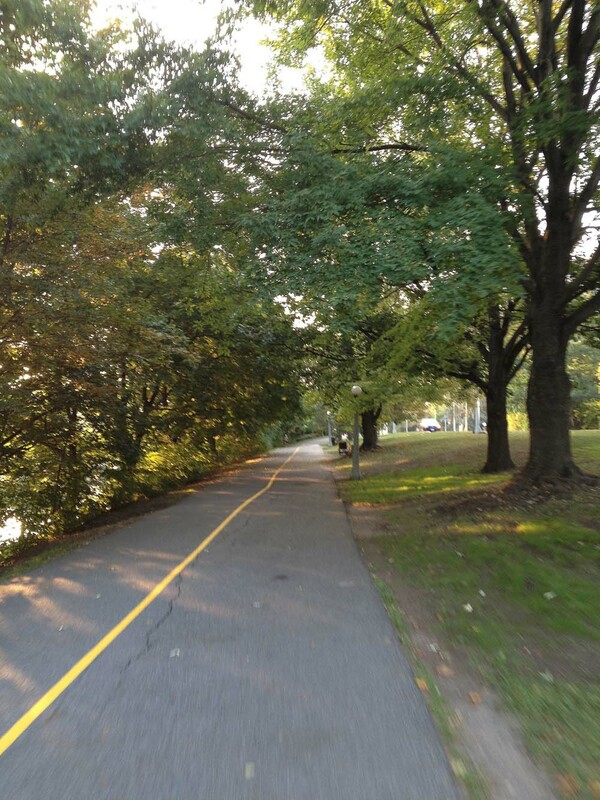 Ride all the way down the ramp past the NAC stage door, and get on the bike path that runs along the canal. 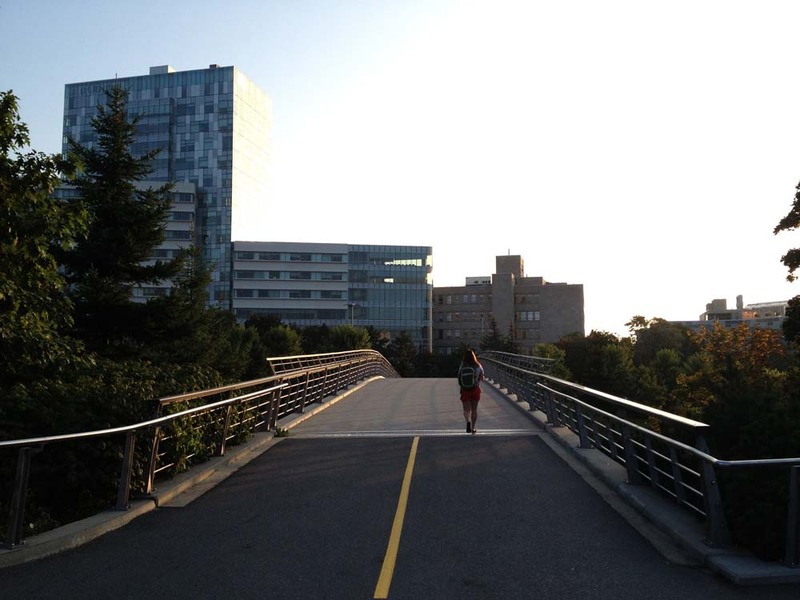 Take the pedestrian/bike bridge over the canal across from Ottawa of University, like so. Continue south along the other side of the canal. Just before the path goes under the Queensway take the turn off that brings you up along Colonel By Drive to Pretoria Bridge, as indicated by the sign in the middle of the fork in the path. You won’t see the big white directional arrow on the path. I photoshopped it in. 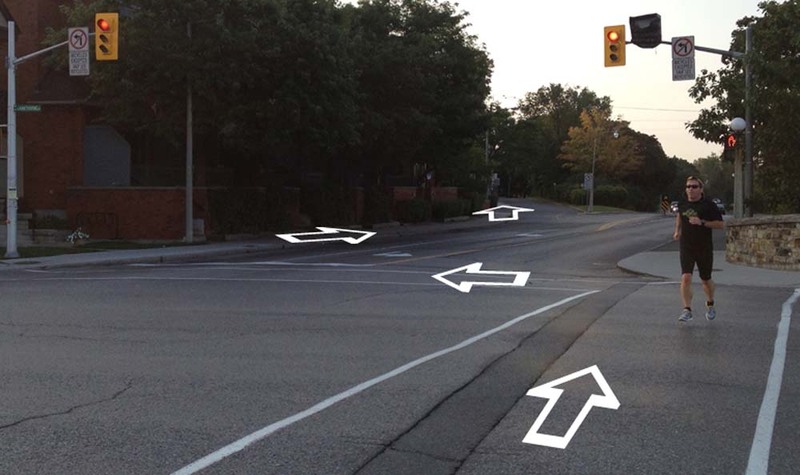 That will take you to the intersection of Hawthorne Avenue and Colonel By, on the east side of Pretoria Bridge. Things get a little tricky here. 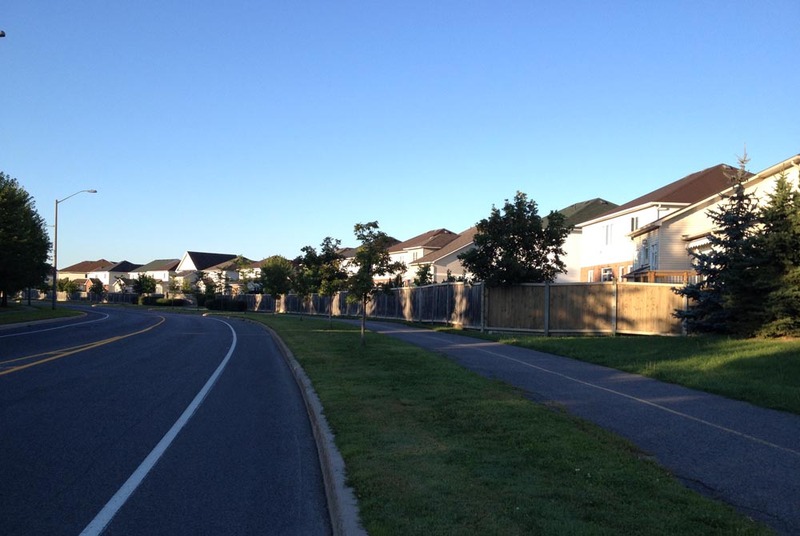 I recommend crossing to the opposite corner and walking your bike for a short distance along the sidewalk south to where it veers left along Echo Drive, like so. Another option when traffic isn’t too bad, is to ride south along Colonel By Drive the short distance from the intersection to the meridian just before Echo Drive where there is a reserved bike exit lane. Turn down the first street you come to on your left which will be Graham Avenue. It has a bike lane. Graham ends at Main Street. The route jogs a bit to the right before continuing as Lees Avenue across the intersection. There is a bike lane along Lees heading east, but it doesn’t start for a hundred yards or so beyond the lights at Main. The Lees bike lane abruptly ends at Chestnut Street. Drivers always speed along Lees Avenue so I turned onto Chestnut. This took me to Springhurst Ave.
At the end of Springhurst get on the stone dust path and veer left for a short distance along the edge of the Rideau River. 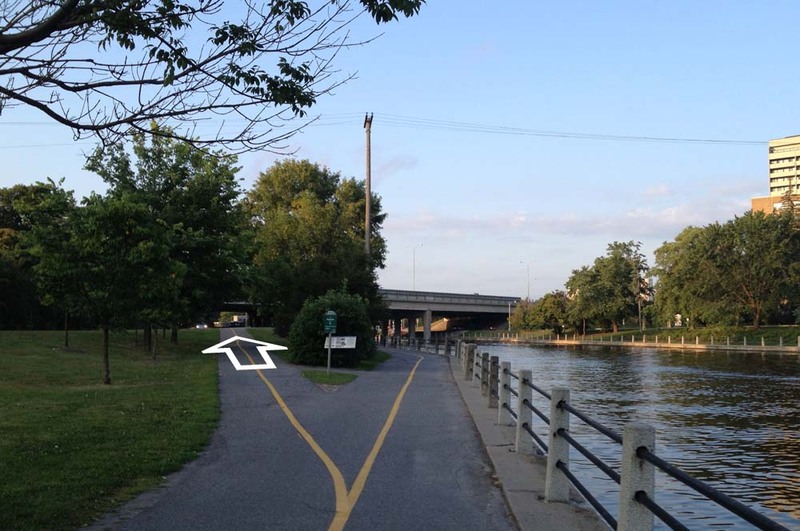 Take the path along the transitway bridge over the river, like so. 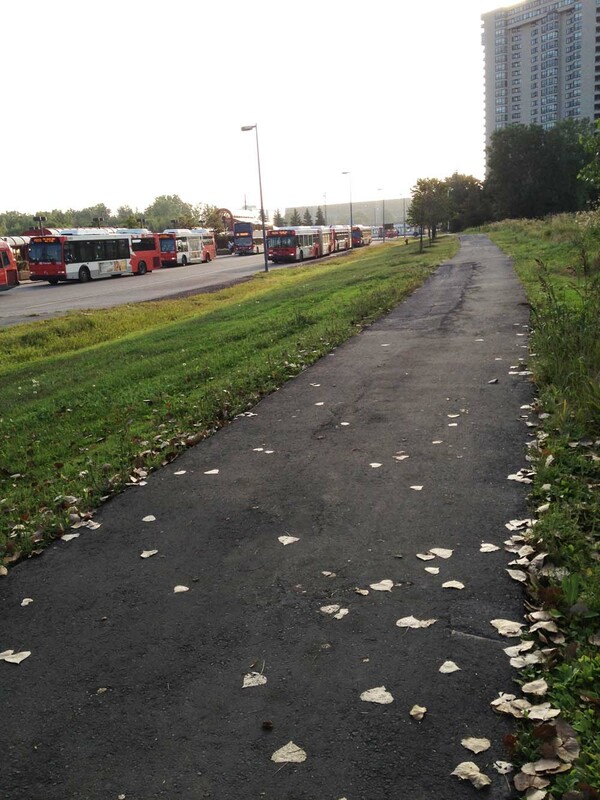 Follow along the path past the big OC Transpo gathering spot. Continue straight on towards the Riverside Drive/ Industrial Avenue intersection. Now I won’t deny this is a spooky major vehicule intersection, however don’t let it intimidate you. There are usually many other pedestrians and cyclists crossing at this spot and the path does continue on the other side of Riverside Drive along Industrial Avenue. Continue along Industrial Avenue, past the giant metal flowers installed in Cancer Survivors Park. The first street you will come to is Alta Vista Drive. 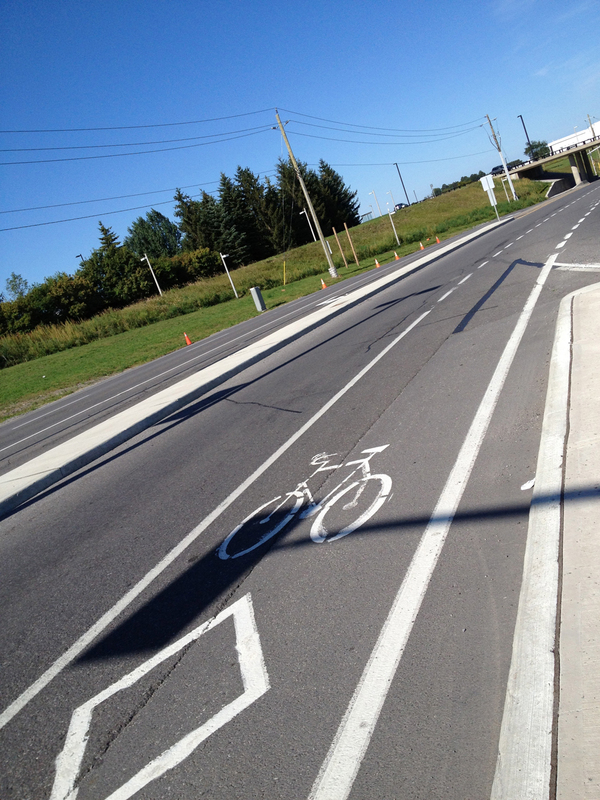 There is a bike path that starts at the south east corner of Alta Vista and Industrial. Follow it. It ends a short distance on at Blair Street. Turn right on Blair, then take an immediate left on Station Boulevard. Follow Station Boulevard right to the end where there’s a bike path that takes you through to Ring Road. 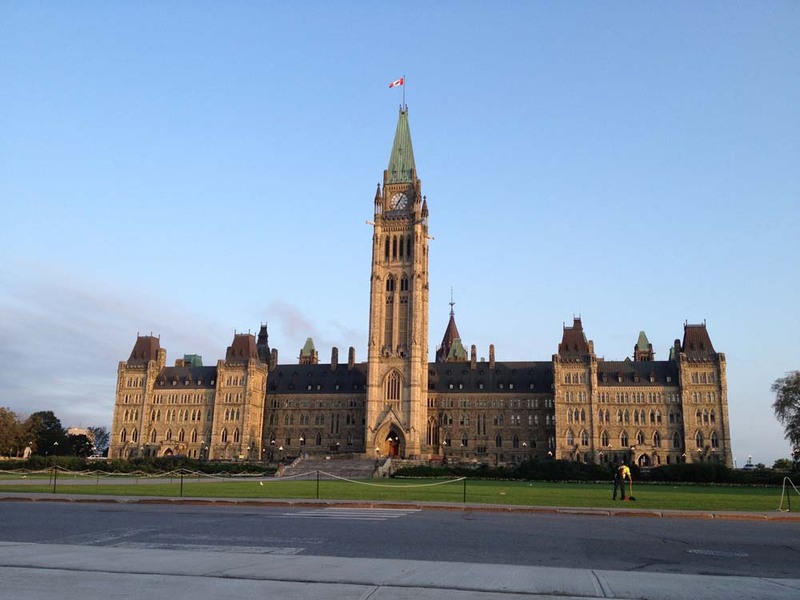 Turn left on Ring Road, which rings around our first destination – the Ottawa Hospital General Campus! For those interested in continuing on further into Ottawa South, exit the Ring Road at the first left which is a car entrance to the grounds of the hospital. 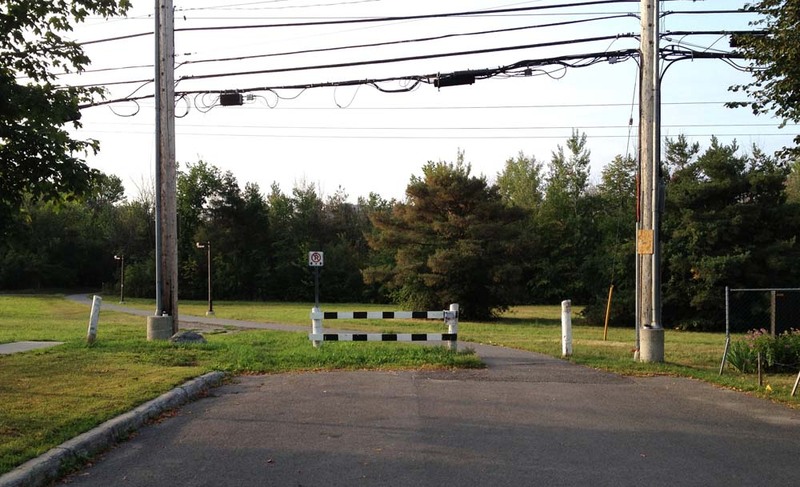 Turn right on Roger Guindon Avenue, and follow it all the way to Smyth Road. Across Smyth you will see the start of another bike path. 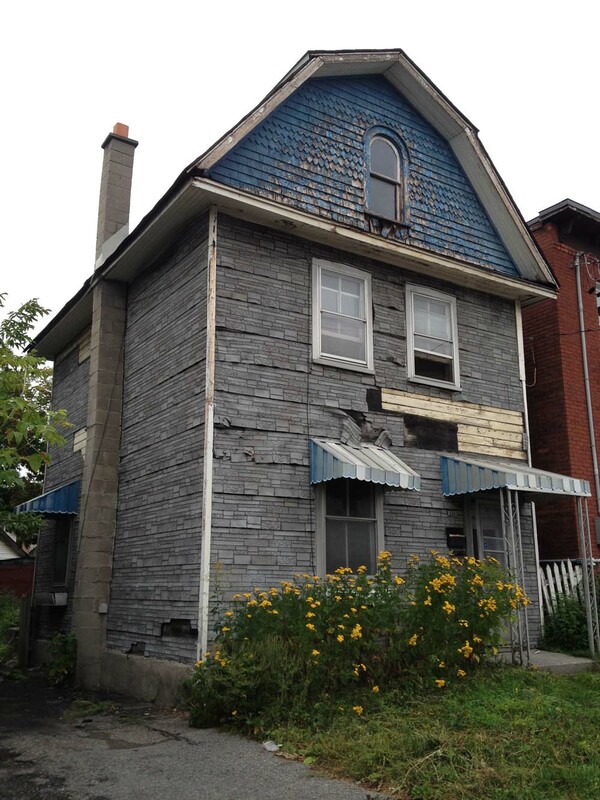 This one is really great, because it travels right across Ottawa South through mostly green space all the way to Walkley Road, and goes past the very impressive Kilborn allotment gardens. Our journey ends here, however for those that wish to travel even further south there are bike lanes along Conroy Road as far as Hunt Club Road. Have a great commute! 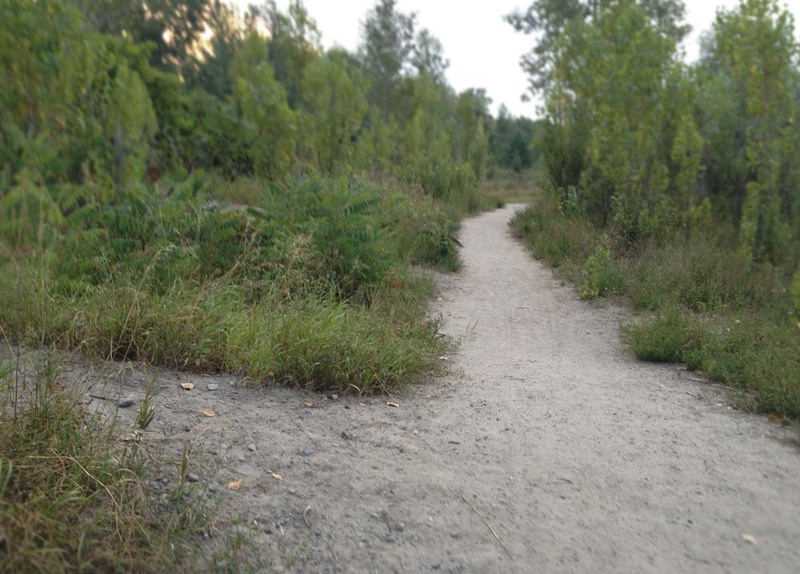 Conroy Pit is a very popular off leash dog park within the south-east part of the Greenbelt, but it is also a great place to explore by bike. Here’s how I did so early Monday morning. Blue line is the route I rode there, red line is the way I biked home. To get there I followed the route described in this post, which took me all the way to the the corner of Hunt Club Road and the Airport Parkway off ramp. That went very well, however the next section along Hunt Club and Bank Street was hell. Speeding traffic weaving in and out of four and six lane traffic with no shoulders at all, that kind of hell. So I recommend following the much safer red route I took to get home. More on that later. 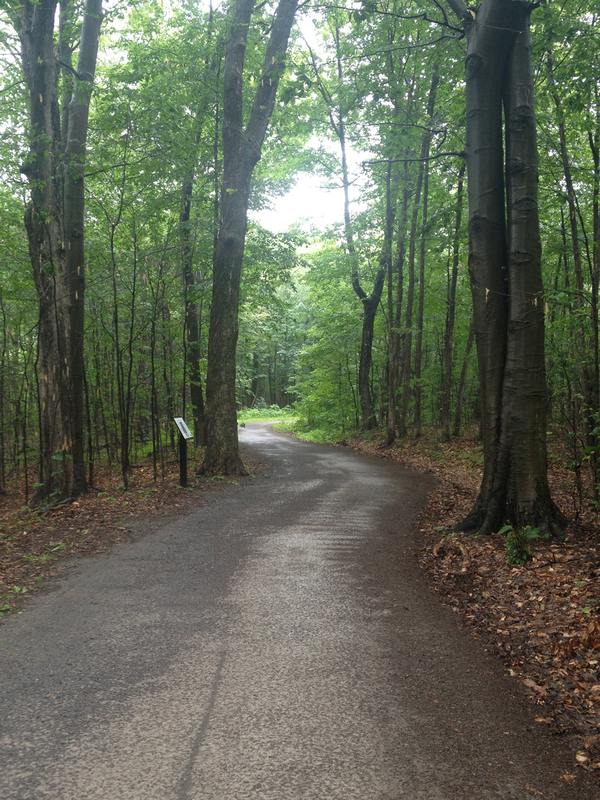 I accessed the park at the north west entrance where Quail Run Road ends, like so. Once in the park the ground is pretty much packed sand everywhere, with a few loose spots, but nothing too difficult to negotiate on a hybrid bike. It would be a sinch on a mountain bike. There is indeed a pit, on one side of which is a hill used for tobogganing in the winter. There were a number of dogs running free along the path so I proceeded at a very comfy careful pace lest they decide to charge on over to say hi, or dart across the path after each other. 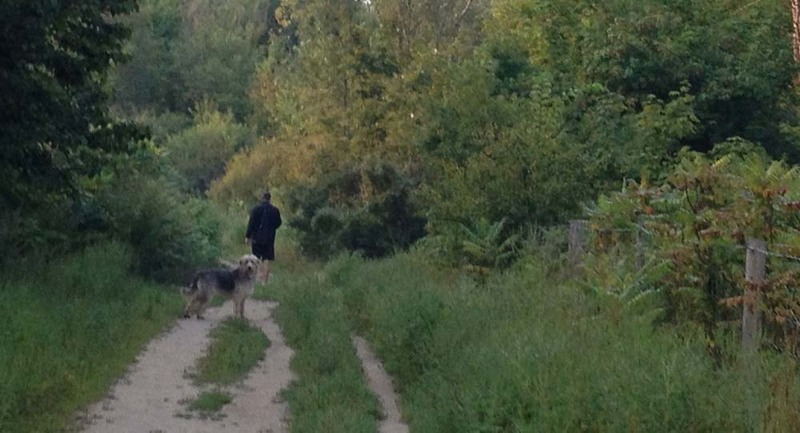 I think there is an unwritten rule you don’t take aggressive dogs to an off leash park. All the dog walkers were very friendly as well, and, by all indications, very good at picking up after their pets so don’t worry about that. There are also lots of small paths not plotted on a map that you could spend time discovering without worrying about getting too lost, as the park is pretty contained. The south eastern part is more wooded. Heading back to town I followed the bike lane along Conroy Road. 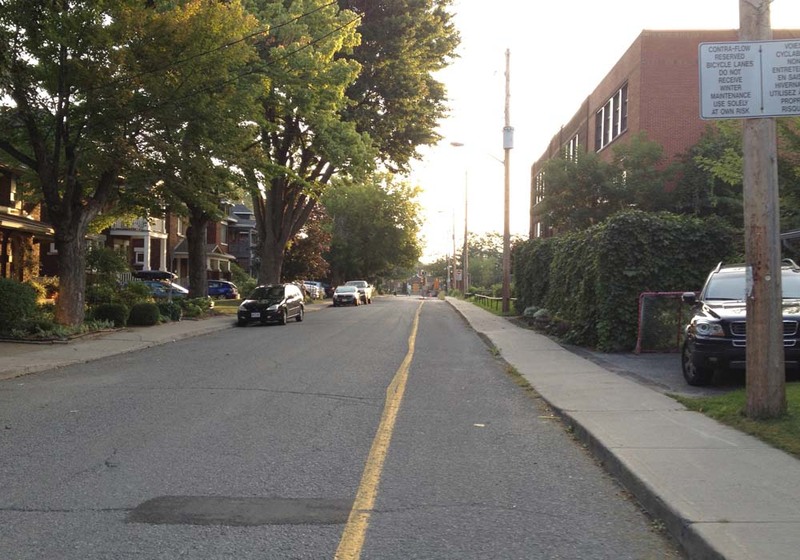 It’s a busy commuter artery, but the bike lane was great for getting me safely all the way to Walkley Road. At Walkley I hopped onto the bike path that runs along the Killborn Allotment Gardens, and then wove my way home along the route hi-lited in red. Et voila. Being in the pits can be fun! 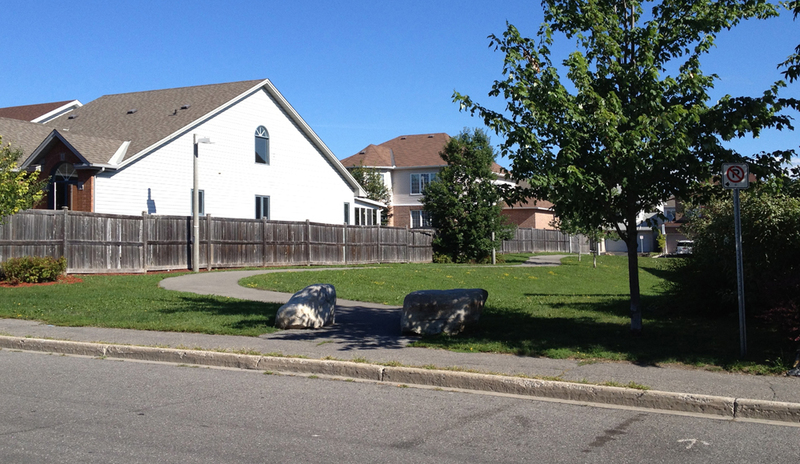 The community of Manotick is a great destination for bikers. 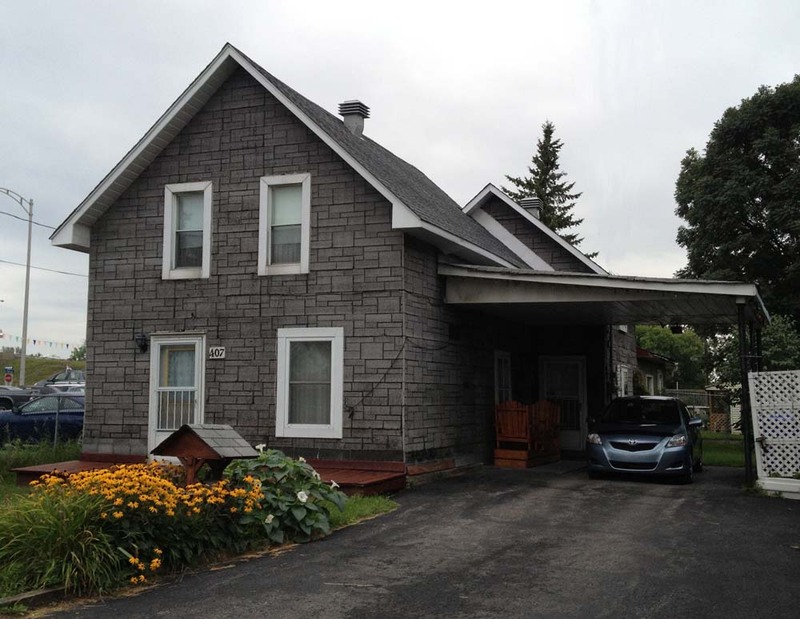 It is located a comfortable 30 km or so up the Rideau River from downtown Ottawa. 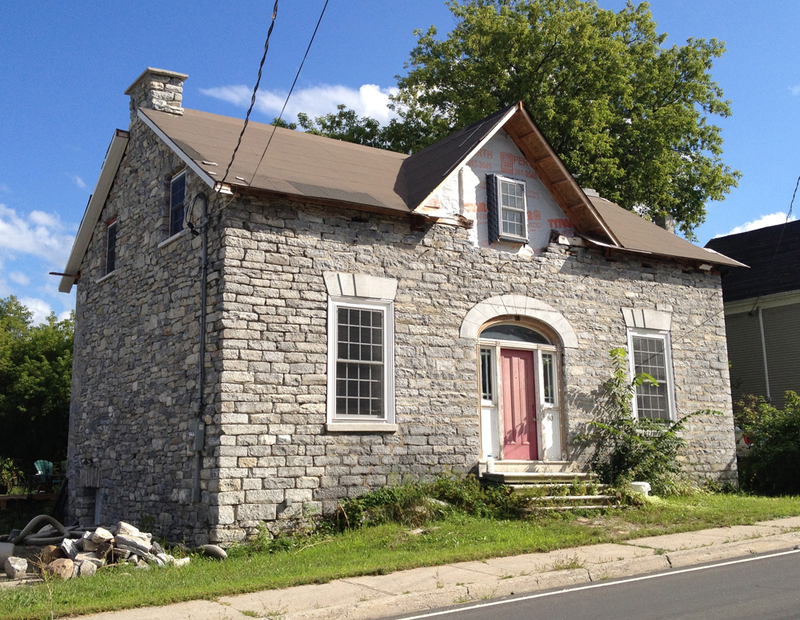 The Village of Manotick was founded in 1859 by entrepreneurs Moss Dickinson and his partner Joseph Currier when they constructed a gristmill on the shores of the Rideau. Their well preserved and still functioning mill remains a symbolic focal point for the community in their attempts to preserve its small town character. 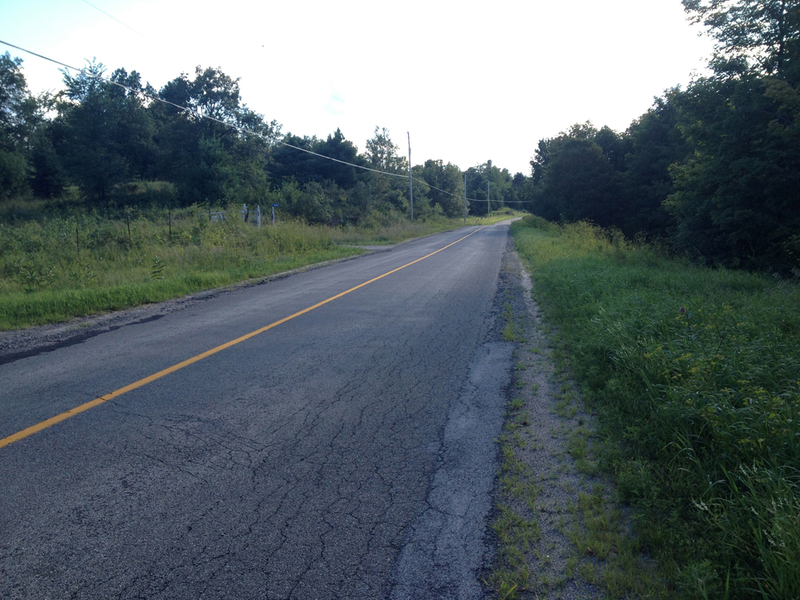 Choosing a safe bike route to Manotick and back can be a challenge, so early last Sunday morning I set out to do so. Here’s what I came up with – blue line on the map below is how I got there, red line’s how I made it back. 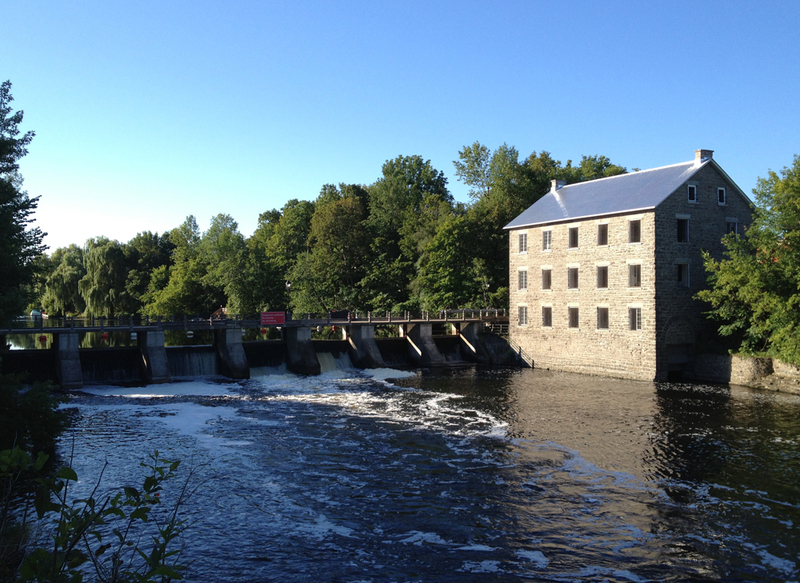 While plotting my route I leaned heavily on two other intrepid bikers who scouted out the journey to Manotick before me, and wrote about it here and here. 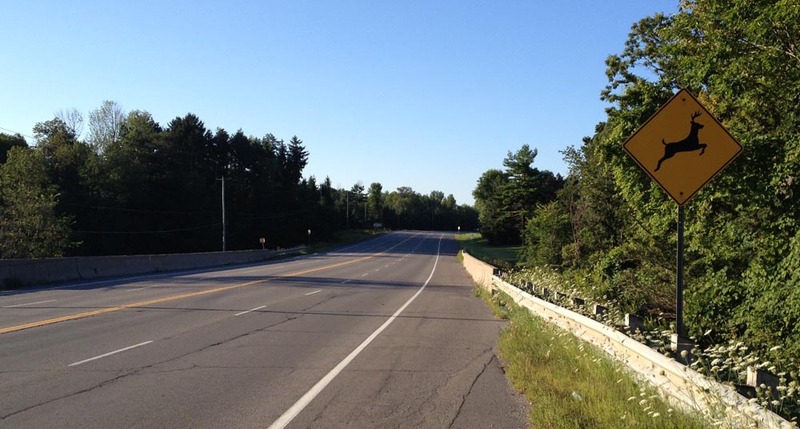 Early Sunday morning is a good time to ride along Prince of Wales Drive heading south. There is a generous shoulder to ride along for most of the way and few vehicules. During the week the ride is much less pleasant with a lot more traffic using it as as a major commuter artery into town, big trucks included. 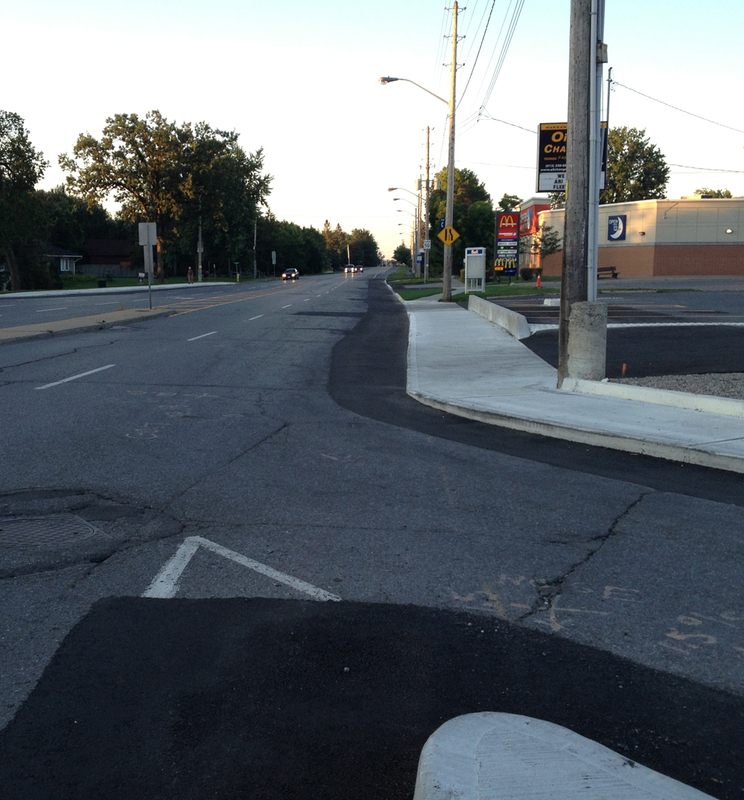 The city has done a fine thing by removing the concrete protrusion that used to stick out from the edge of the road at the Hog’s Back intersection. Before bikers travelling along the shoulder of the road were suddenly obliged to merge into traffic. This fixes that. 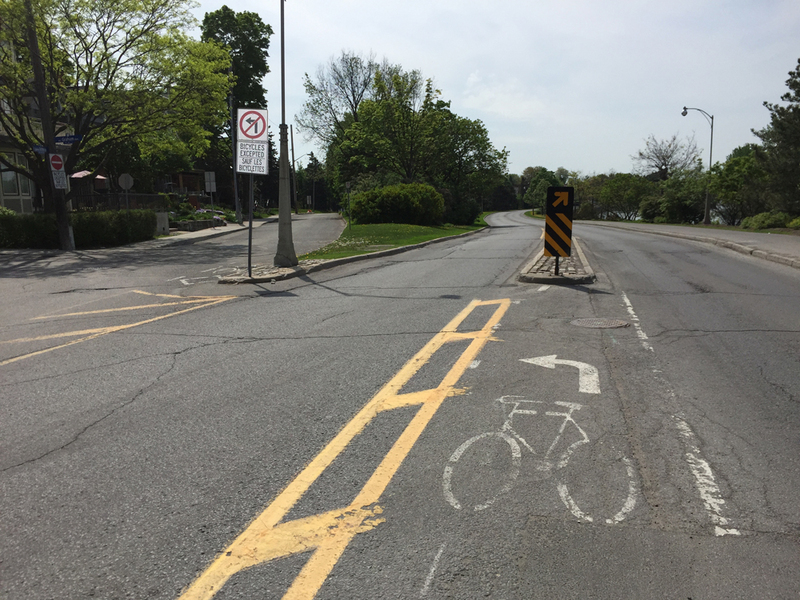 Unfortunately the problem persists at all other intersections between Hogs Back and Fallowfield Road, the worst instance being the approach to Rideau Heights Lane where Prince of Wales takes an uphill turn, providing little chance for overtaking traffic to notice riders. I rode off the road onto the well worn gravel path shown below. This worn path’s existence is indicative of how much this corner is a safety problem for bikers and pedestrians. So, be extra careful wherever Prince of Wales meets another street. 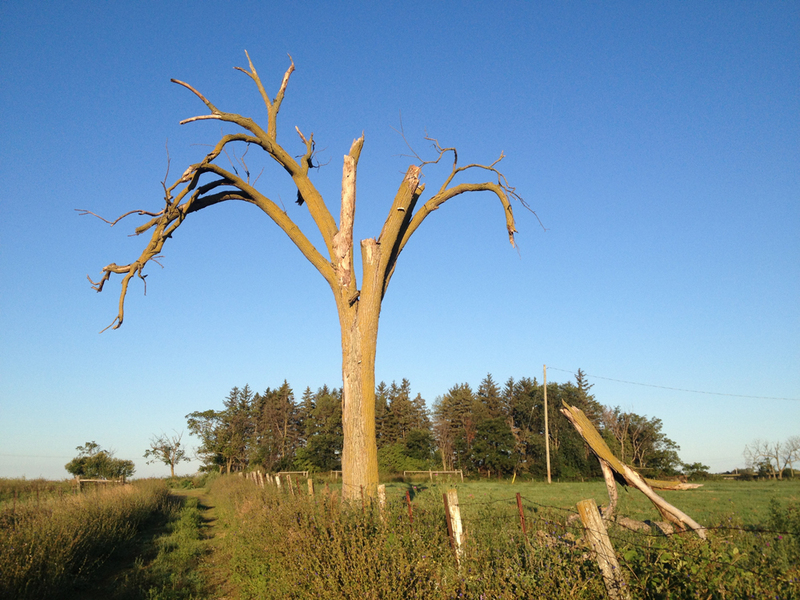 Otherwise, enjoy the scenery, like this interesting old dead tree. I’ve heard that Prince of Wales from Fallowfield Road to Manotick is pretty treacherous so I avoided it by riding along residential streets and a wonderful stone dust path through the woods. Here’s how. First, turn off Prince of Wales onto Fallowfield. 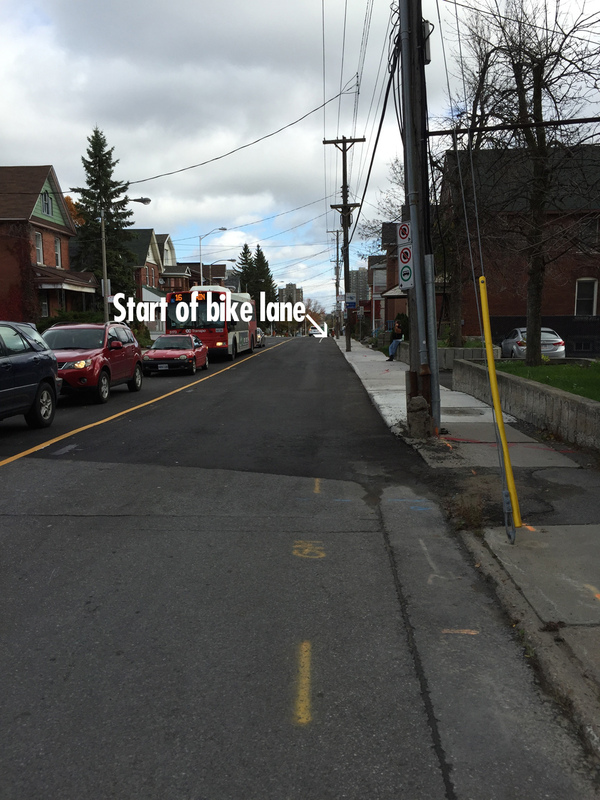 It has a generous bike lane, as does Merivale Road, onto which I turned and headed south. 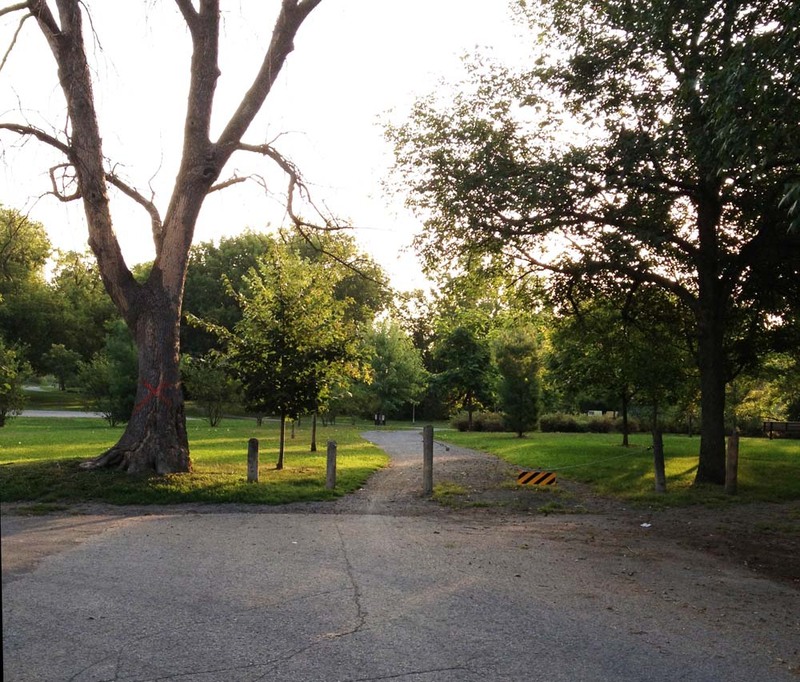 Leave Merivale and turn onto Leikin Drive, along which there’s a generous shoulder AND a recreational pathway to choose from, like so. Leikin turns into Cresthaven Drive and the bike lane disapears, but the ride is through residential areas which have very little traffic on Sunday mornings. Cross Strandherd, and turn onto a path that runs alongside heading east like so. 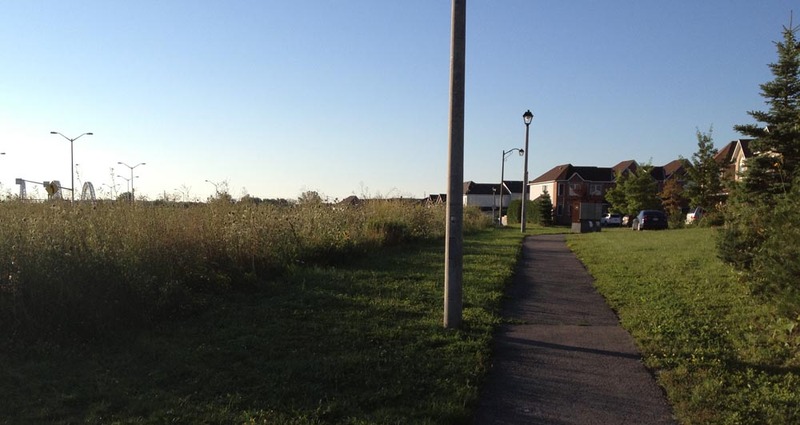 This will alternate between short stretches of paths and streets until you get to Bakewell Crescent. The Strandherd Bridge across Prince of Wales is still being constructed, so I went and took a closer look. Pretty amazing structure. 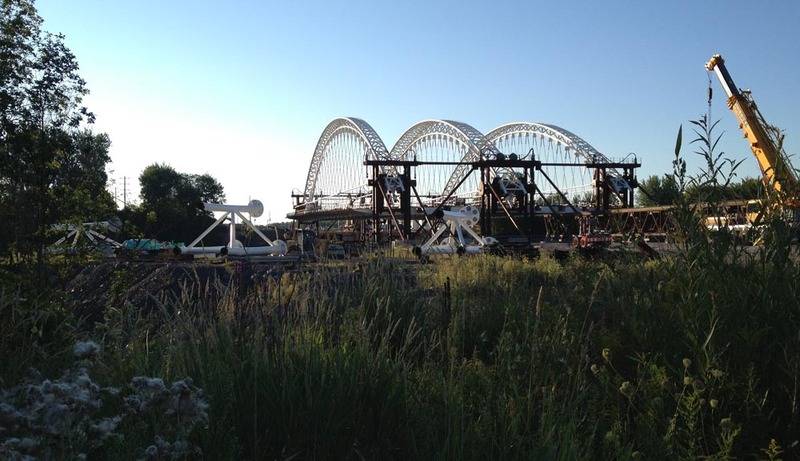 UPDATE– July 2014: The bridge is completed, and it’s pretty impressive! I test rode it shortly after it opened and described it in this post. 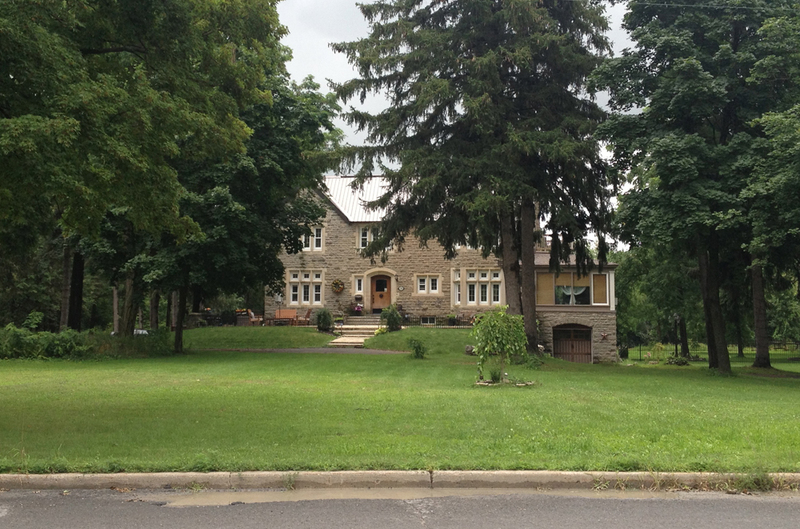 Follow Bakewell Crescent to Rocky Hill Drive, which crosses Prince of Wales to Lodge Road. 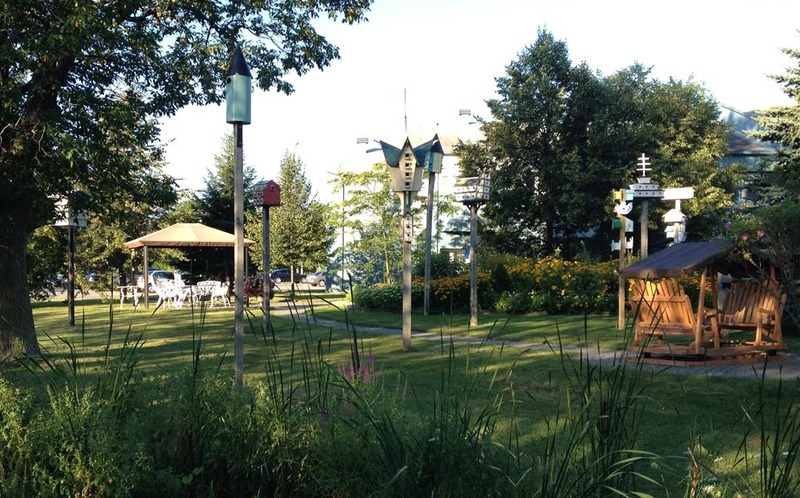 Very pleasant little street, with the Rideau River on one side, and the Carleton Lodge Long Term Care Home on the other, which must hold the title for the most eclectic collection of birdhouse architecture in the region. 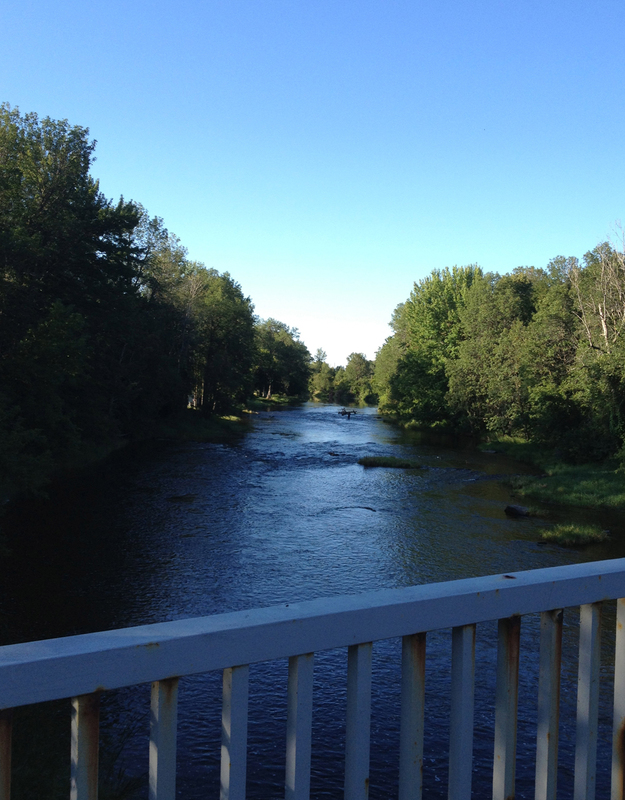 To get over the Jock River one has no other choice but to get back on Prince of Wales Drive. Fortunately there is a shoulder along this stretch, like so. Once over the bridge there is a gravel path on the Rideau River side that takes you down to a trail which you will need to cross over Prince of Wales to get to, like so. The trail weaves its way through woods and over little streams flowing to the Rideau River. At one point the path splits. There aren’t any directional signs so I chose to veer left along the river, which led to this series of flat faced boulders strategically placed to help get across a brook. It was very easy to negotiate carrying my bike, however if this seems inconvenient (trailer pulling, loaded panneirs, etc), the map suggests that, by following a path to the right towards the Rideau Valley Conservation Authority building, you can avoid this zen garden-ish method of river crossing. But I’m not sure, didn’t check. My apologies. 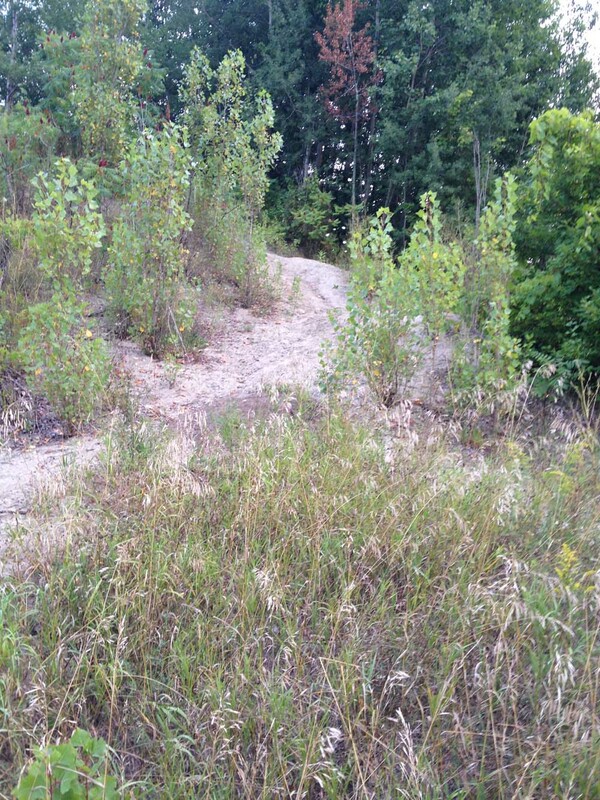 Eventually the trail comes out at Lockview Road. For a more detailed description of the trail just travelled, albeit heading in the opposite direction, click here. 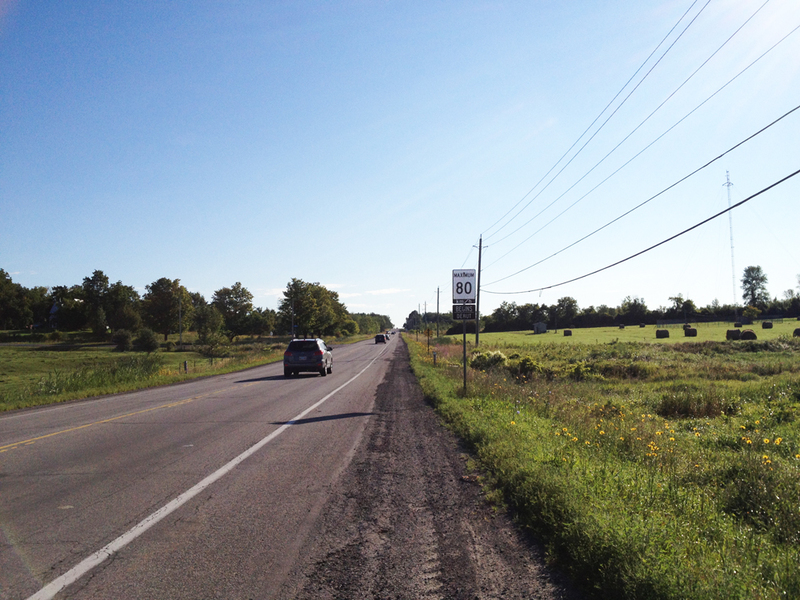 I then rode along Barnsdale Road to get onto Long Island, which sits in the middle of the Rideau River. 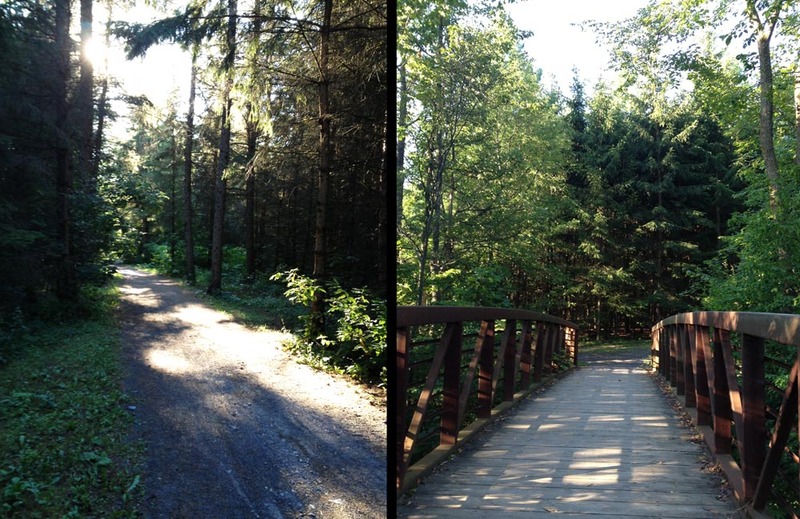 Turn onto McLean Crescent, until you reach a path that takes you through George McLean Park. You’ll recognize it by the hockey boards all up and ready for next season. 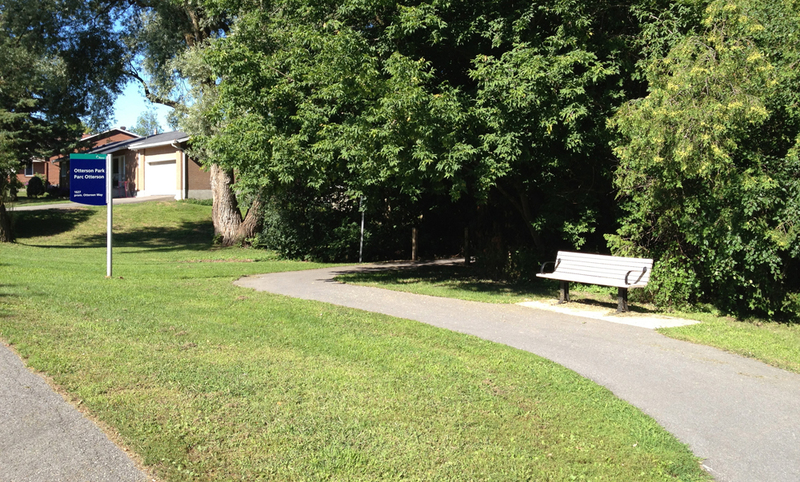 Once through the park carry on along West River Drive and cross Bridge Street on into AY Jackson Park, named after one of the Group of Seven painters who lived in Manotick for a spell. Ride on down the path to the great lookout over the river towards Watson’s Mill. 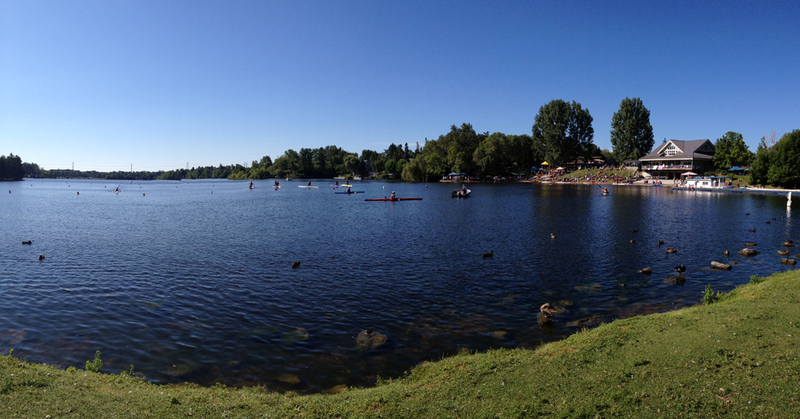 Et voila – made it to Manotick! Time to head back to Ottawa on the east side of the river, but before doing so I explored the southern tip of Long Island, which is mostly residential with a mix of big bushy trees, like so. Then over to the north-east shore via Bridge St. As you can see it was pretty busy even on a Sunday morning. Cars also tend to speed over this bridge, so, depending on the amount of traffic, you might consider walking your bike along the sidewalk. Bridge Street becomes Mitch Owen Drive. It’s got a shoulder, but it’s got lots of fast traffic too. I prefer roads with less traffic even if they are shoulder less, so I turned up Spratt Road. 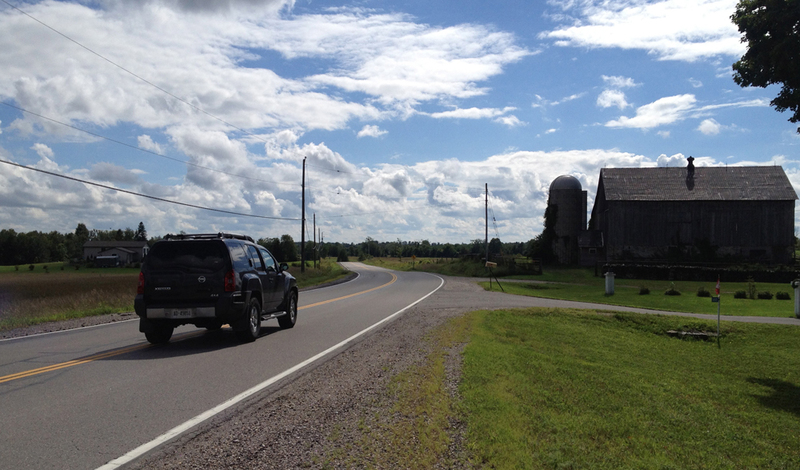 The above photo is also the intersection where I turned east onto Rideau Road, which is similar to Spratt Road in terms of surface quality, amount of traffic and farmland scenery. 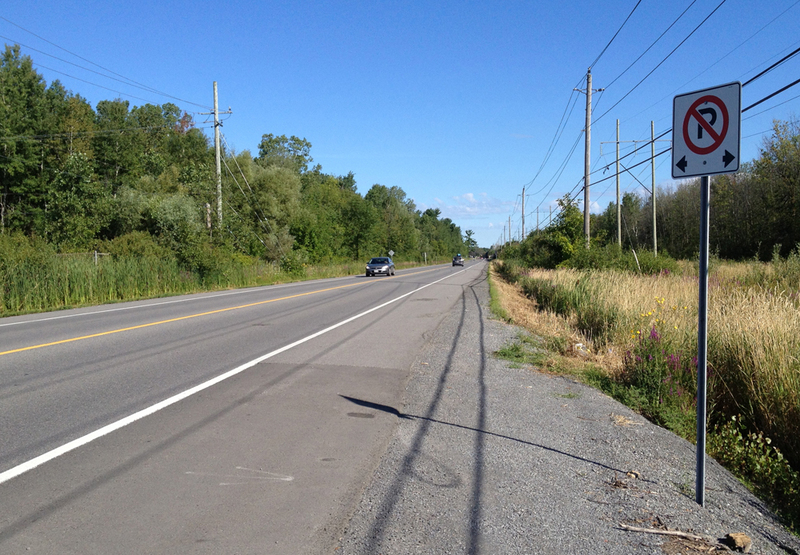 I Continued along Rideau Road until Bowesville Road where I turned north. Very nice road – not much traffic and excellent shoulders. AND, if your timing is right, you might spot a big metal low flying bird. It’s a bird! It’s a plane!! It’s Supe…., it’s a plane. When you get to the end of Bowesville Road Where it crosses Leitrim Road you will be greeted by a chain link fence topped with barbed wire and no access signs. Fear not! 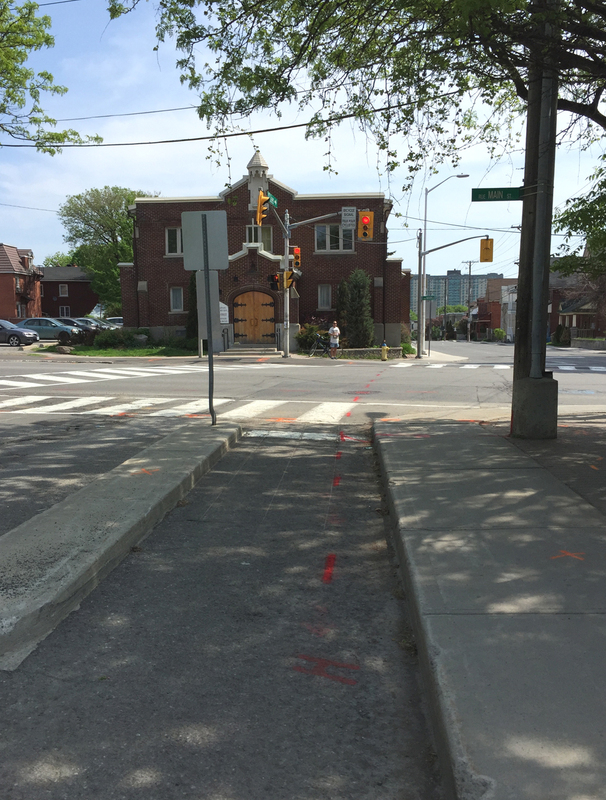 There’s an inconspicuous access point right where the arrow is pointing for cyclists and pedestrians to get through. Once you’re through, follow the road around the airport. The Uplands Drive intersection and stretch to the Airport Parkway was a bit confusing and felt like a freeway off ramp. There is a generous bike lane along Uplands that takes you under the Airport Parkway, like so, but be extra careful as it crosses merging traffic lanes, and cars always seem to be rushing to and from the airport. Once clear of the Airport Parkway, Uplands is endowed with great big shoulders like so, making it a pleasure to ride along. It’s also very popular with the zip-zip set. This was the third pack that passed me heading in the opposite direction. Hi! Hi! Hi! Hi! Hi! Hi! Hi! Hi! Now the next trick is finding a safe way to the recreational path along Mooneys Bay, which primarily means avoiding riding along Hunt Club Road, Riverside Drive and Walkley Road, all very busy, not very bike friendly roads. 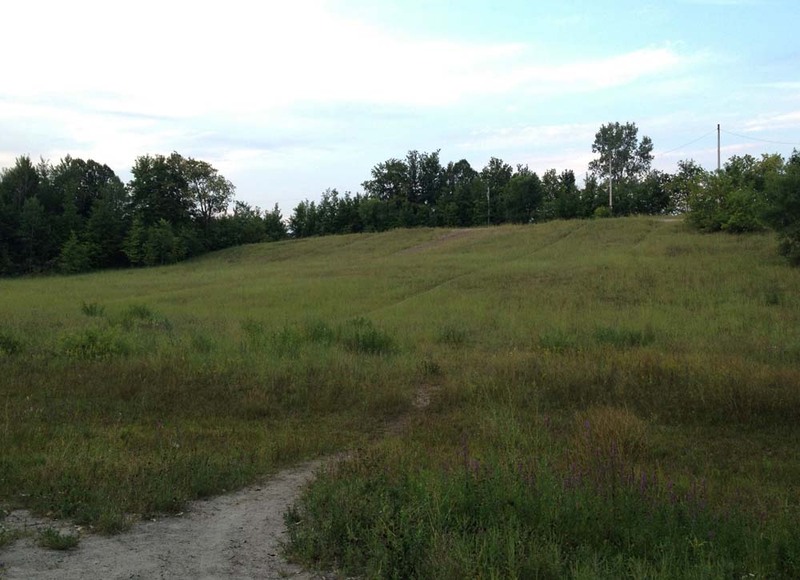 Here’s how: Continue along Uplands across Hunt Club. Turn right on Cahill Drive West and then left on Twyford Steet. 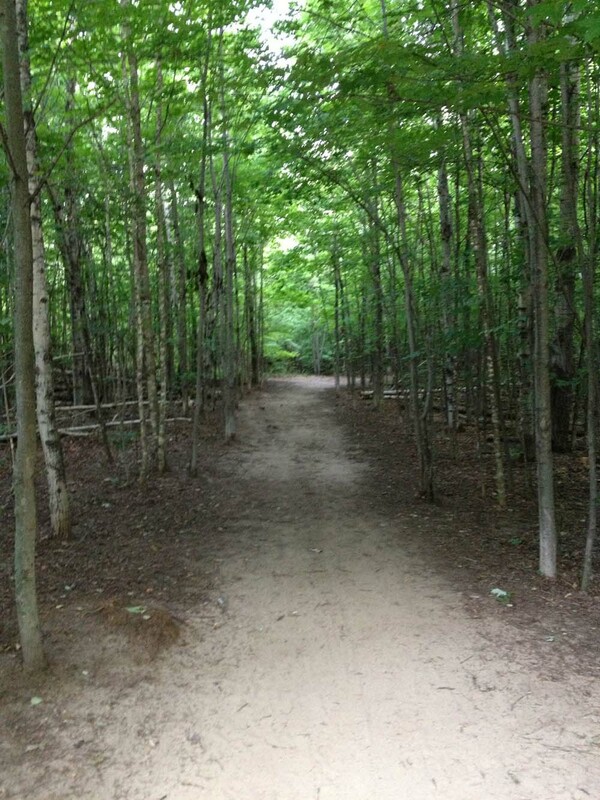 Than cut through to Annapolis along this short path. 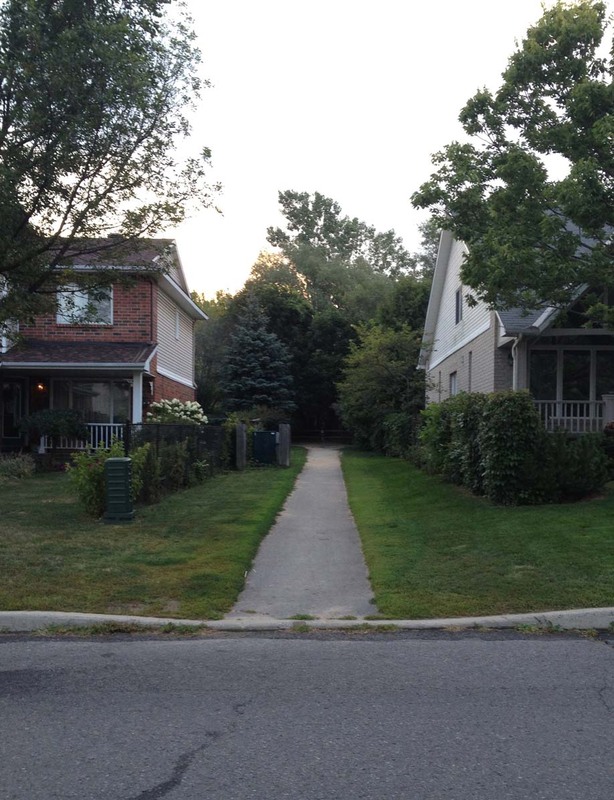 Turn left on Annapolis, left on McCarthy, left onto Southmore Drive West and finally left on Fielding Drive for just a short distance until you reach a short path on the right like so. It takes you under the train tracks through to Otterson Drive. 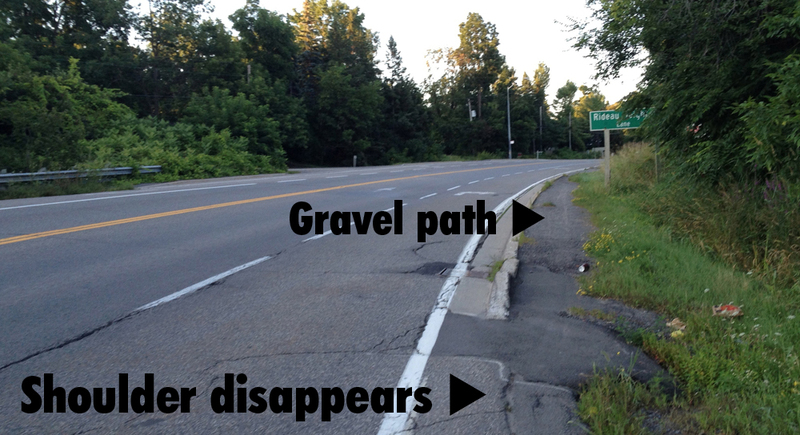 Shortly after Otterson Drive curves left there is another short path like so…. 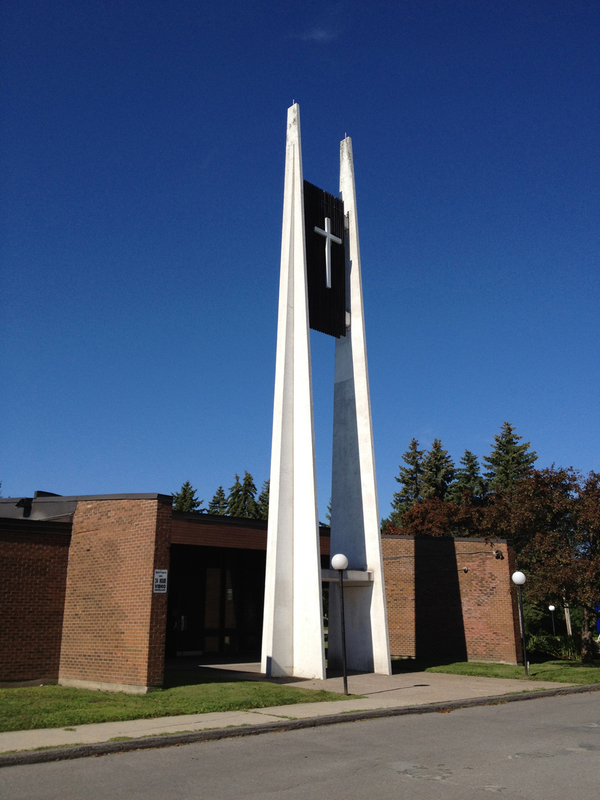 Which takes you through to the Riverside United Church Parking lot. Cross Riverside to the path that takes you through Mooneys Bay. 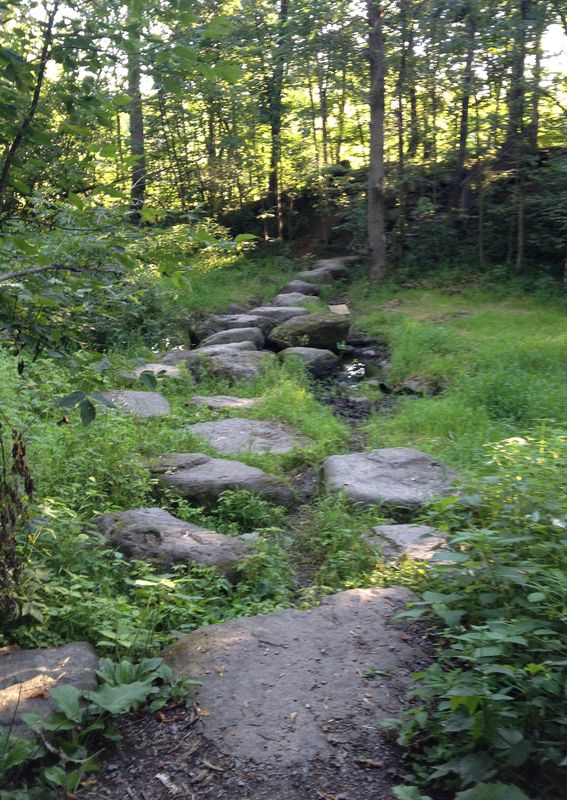 Continue along the path, cross the bridge over Hogs Back Falls, and, if you wish, check out a regatta. It being Sunday, there’s a good chance you’ll be able to bike right down Colonel By Drive which is closed for Sunday Bike Days. So there you go. 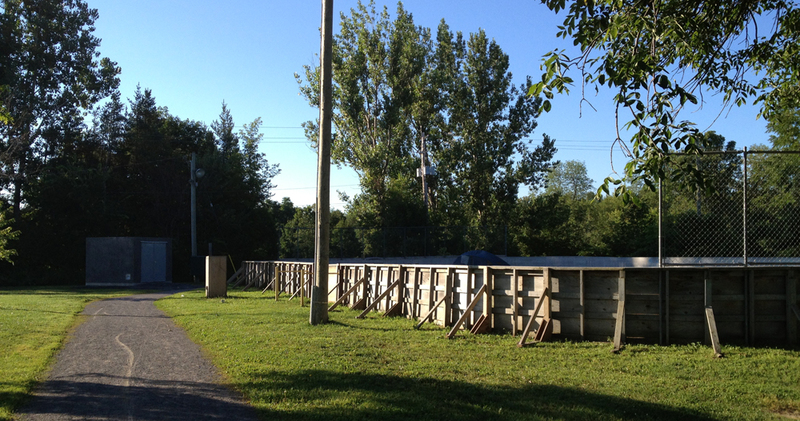 A fine early Sunday morning ride to Manotick. Happy Trails! 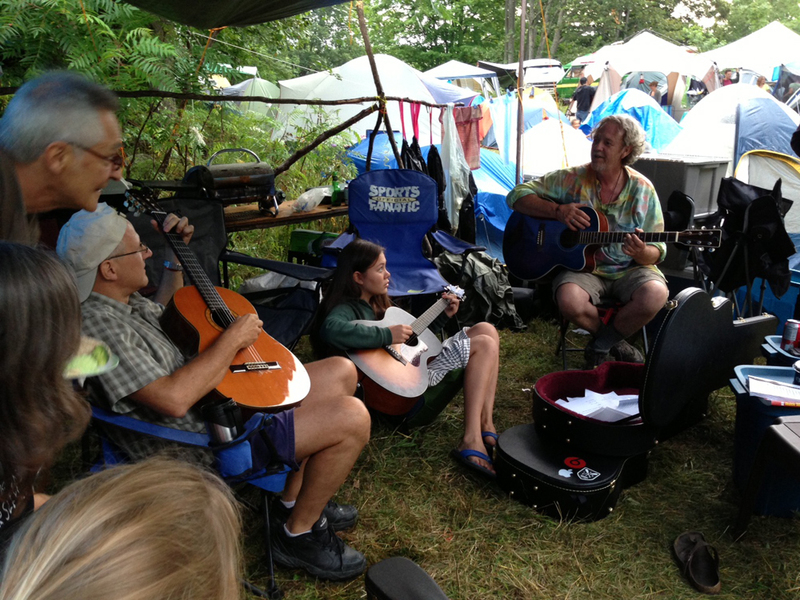 Last Thursday I biked to a friend’s cottage on Sharbot Lake just south of the Blue Skies music festival, and then rode up to the festival site the following morning to set up our tent. Here’s how it went. 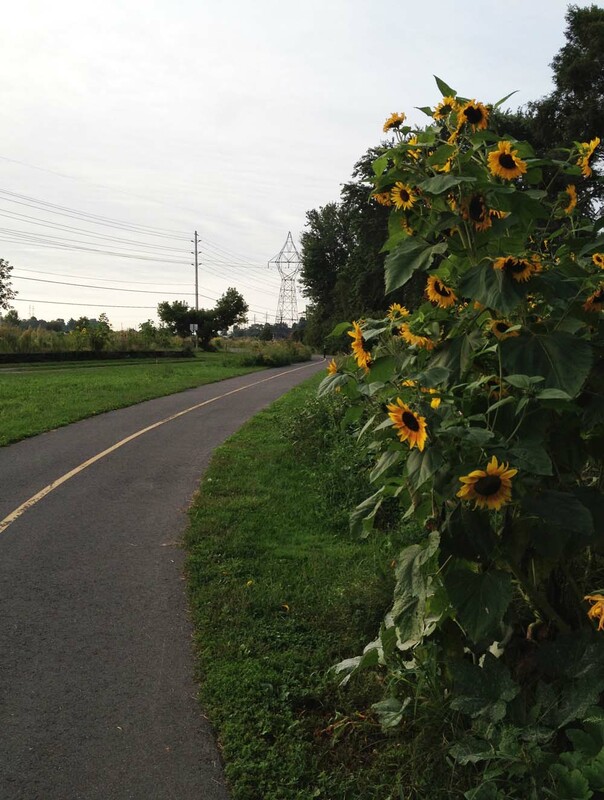 To get out of Ottawa I followed the Ottawa River Pathway and Watts Creek Pathway as far as Moodie Drive. A description of those paths can be found on this post. 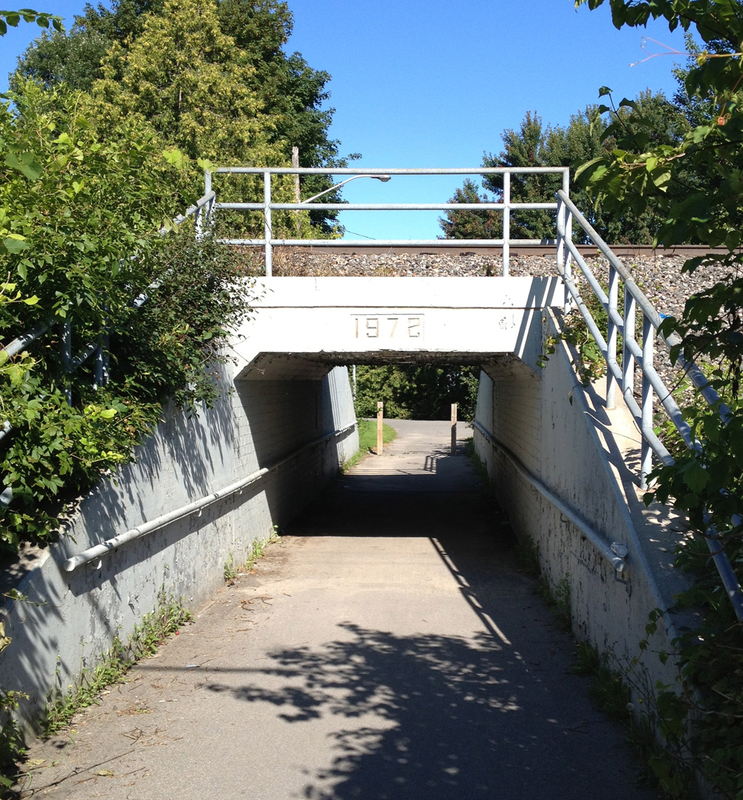 Rather than follow Watts Creek Pathway which continues on the other side of Moodie, I rode along Corkstown Road to where it meets the Greenbelt Pathway before it goes under the Queensway. This section of the Greenbelt Pathway is a very pleasant meander through fields and woods. 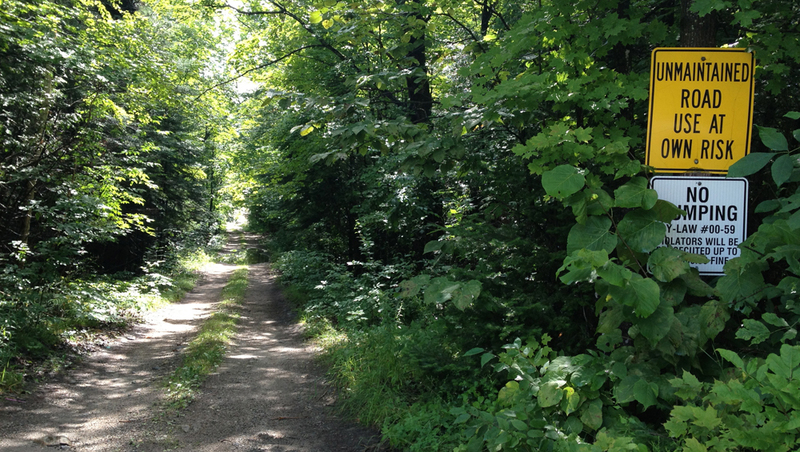 I followed this path as far as Robertson Road to where it joins the rail-to-trail path that takes you all the way to Carleton Place, as described in this post. 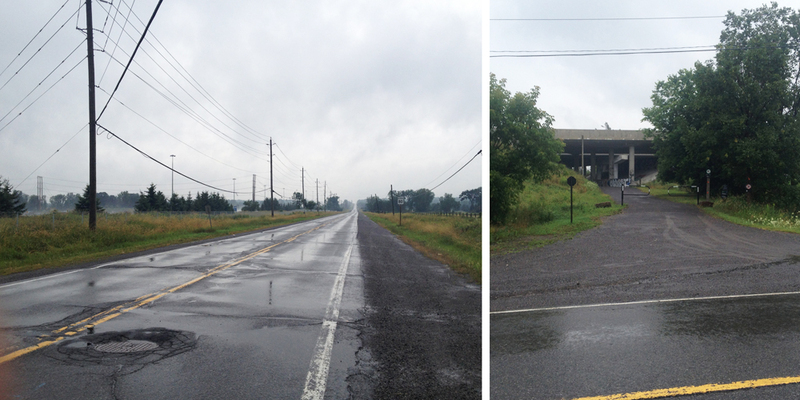 This time I rode through the rain, which made the crushed gravel a little slower going. 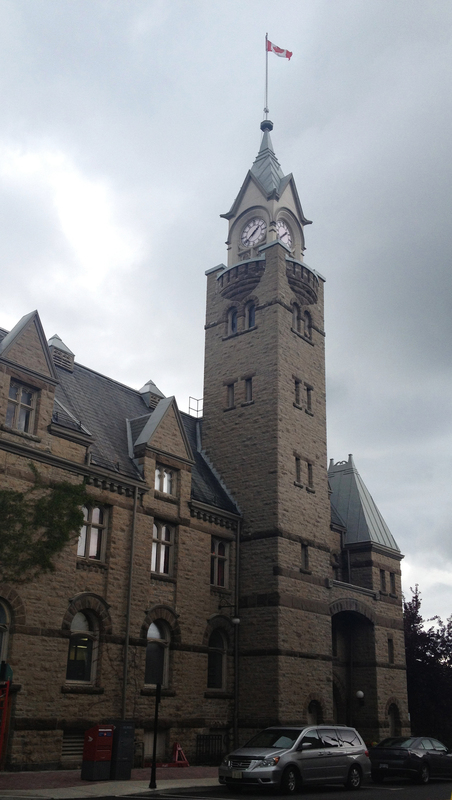 Carleton Place has a number of fine heritage buildings to ponder on your way through, such as the Town Hall on the edge of the Mississippi River. I crossed the Mississippi at Bridge Street, and then headed South West on High Street – a safe road to bike down, with big old houses on either side as you head out of town. 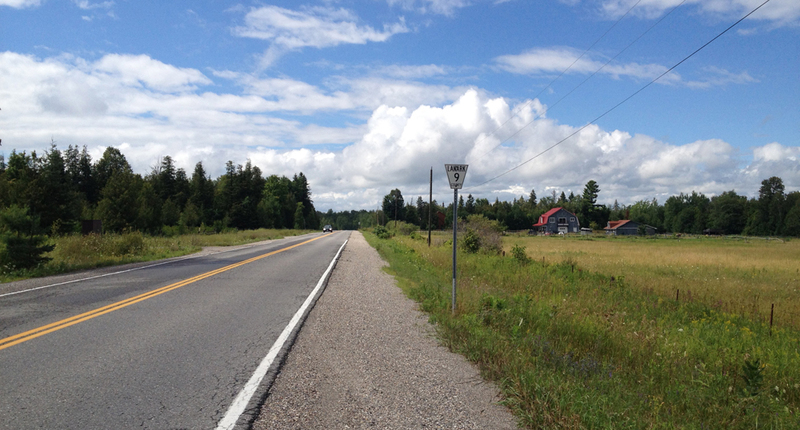 I then followed the Trans-Canada Highway for a 4km stretch. The Trans-Canada is a terrible two lane road to ride on. Folks drive along it as fast as they can to get from point a to b. That includes big transport trucks. 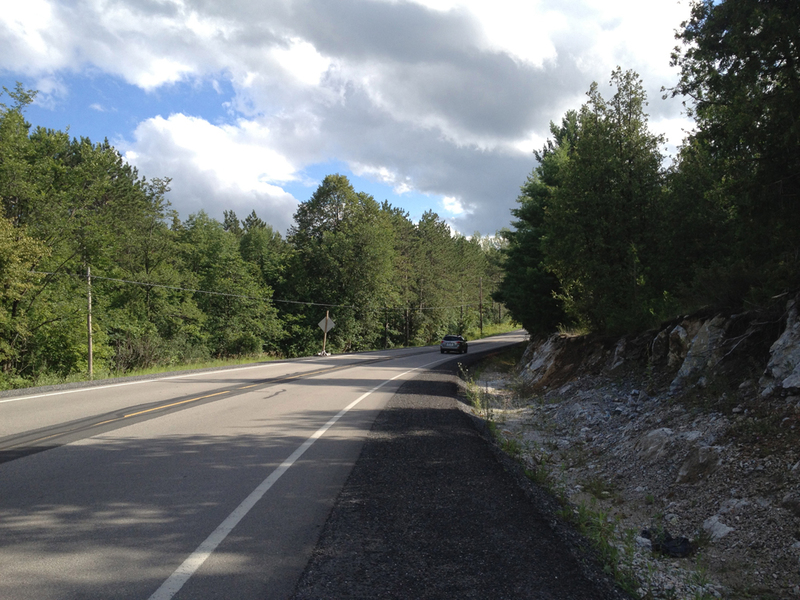 Fortunately the section heading out of Carleton Place has a small paved shoulder and packed gravel that’s ride-able. I regret not having a small mirror attached to my helmet or handle bars to anticipate trucks roaring up behind me. It would have helped brace myself for the backdraft that shakes you on your bike as they pass. I turned onto Tatlock Road, a two laner that wasn’t too busy. Before this trip I hadn’t realised how generous Google Maps is in their interpretation of what constitutes a road, that is until I reached the turn off to Forest Road. 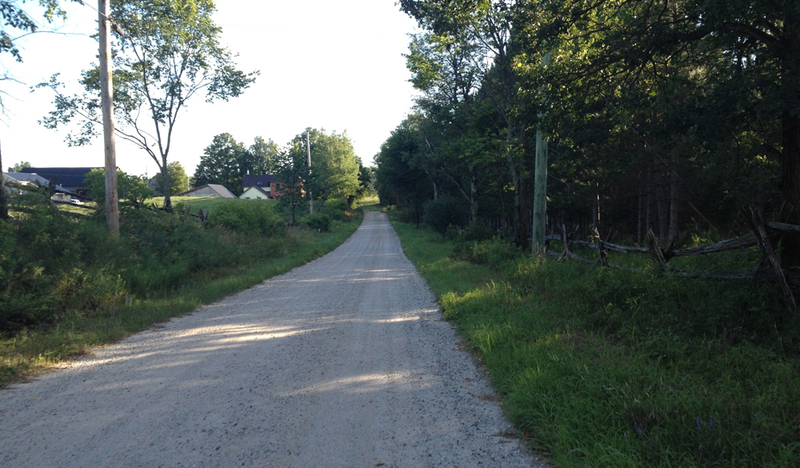 That’s OK, says I. Carla had a copy of my route and my phone still had batteries, so off I went down Forest Road. It was a little bumpy, but quite bikeable. After crossing Old Perth Road, Forest Road became much more navigable, like so. Concession Road 1 Ramsay and Boyds Road which became Ferguson Falls Road were very similar – packed gravel through farmland. Very nice to bike along. 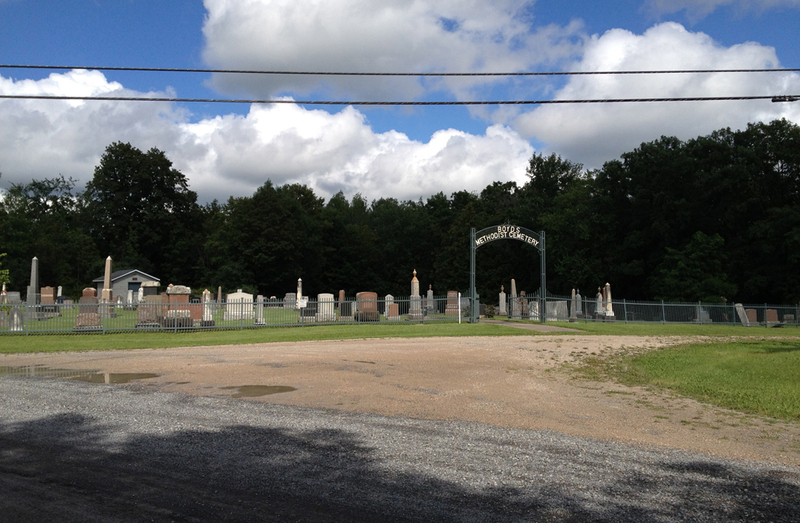 This Methodist graveyard along Ferguson Falls Road is located just before Pine Grove Road, or Route 12. I was struck by the landscape’s layers of rich contrasting colours. I quickly discovered cars like to travel fast along route 12. Not as fast as on the Trans Canada, but still pretty fast. 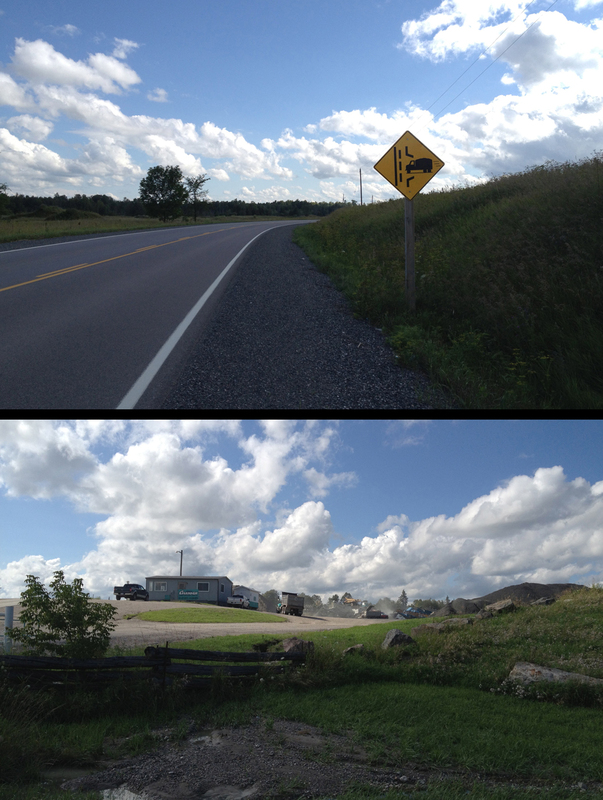 There were also a number of dump trucks travelling in the opposite direction, that I soon discovered were heading away from a huge quarry just off Route 12. I rode into Lanark Village and paused long enough to buy liquids at their general store. I sensed this was a very special place, full of resilience and rich heritage. 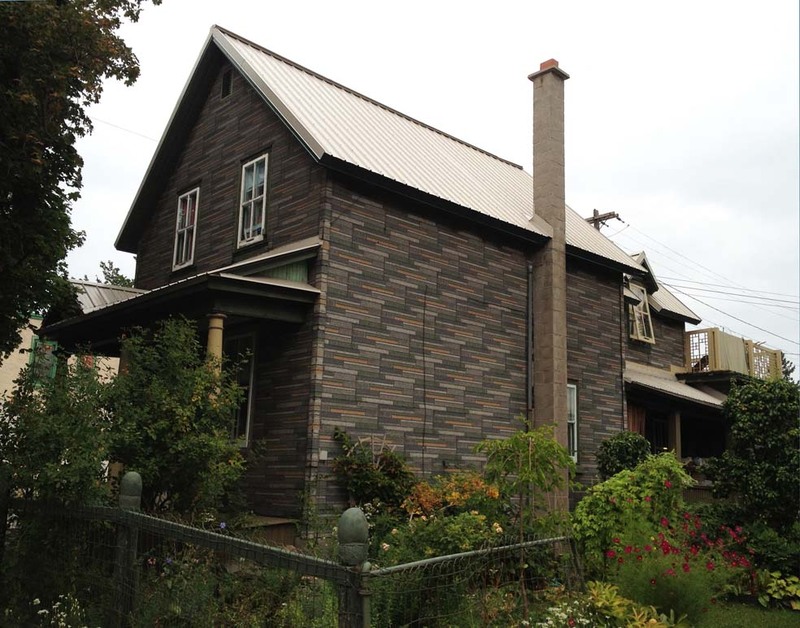 This building for example, that someone is conserving and re-pointing. I’ve since found this walking tour of Lanark Village that describes some of the towns origins. Can’t wait to re-visit. 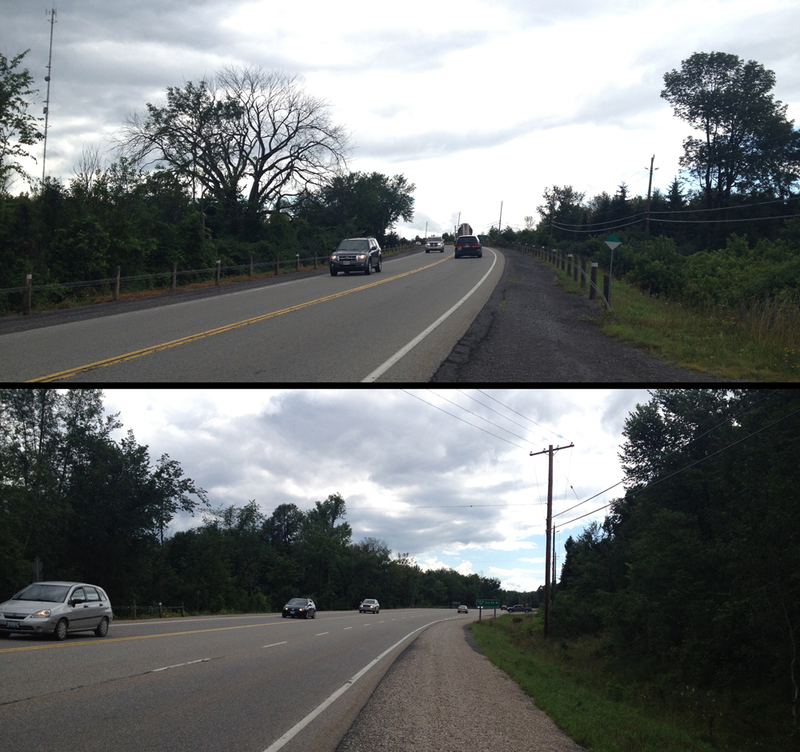 Route 12 heading South of Lanark felt a lot safer with fewer cars and a nice wide shoulder in places. 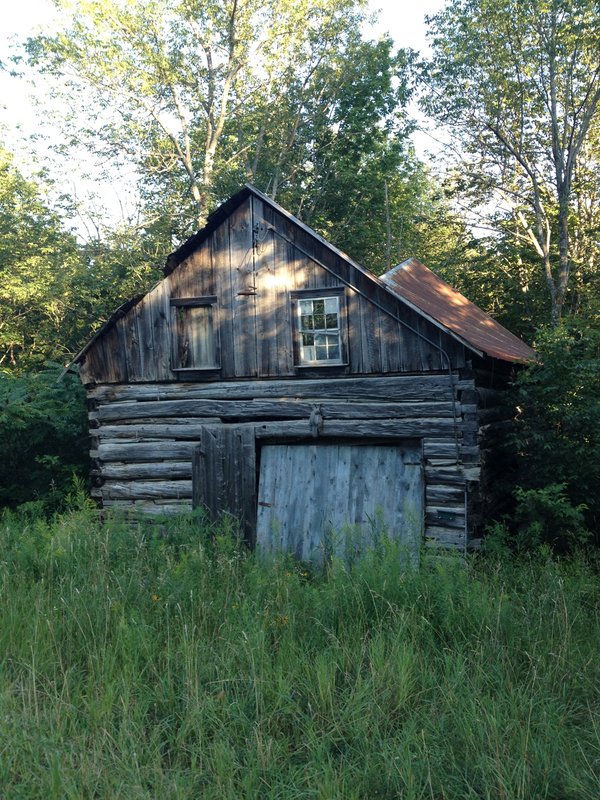 Lot’s of cedar post fences like these. They are also right in the middle of paving the road further south in a way that suggests a wider shoulder will be in the offing. While I was humming along on this fresh asphalt I almost missed a little sign indicating Hunter Side Road, which was supposed to be my next turn. Where was the road? Just there, over the edge where the white arrow is pointing. 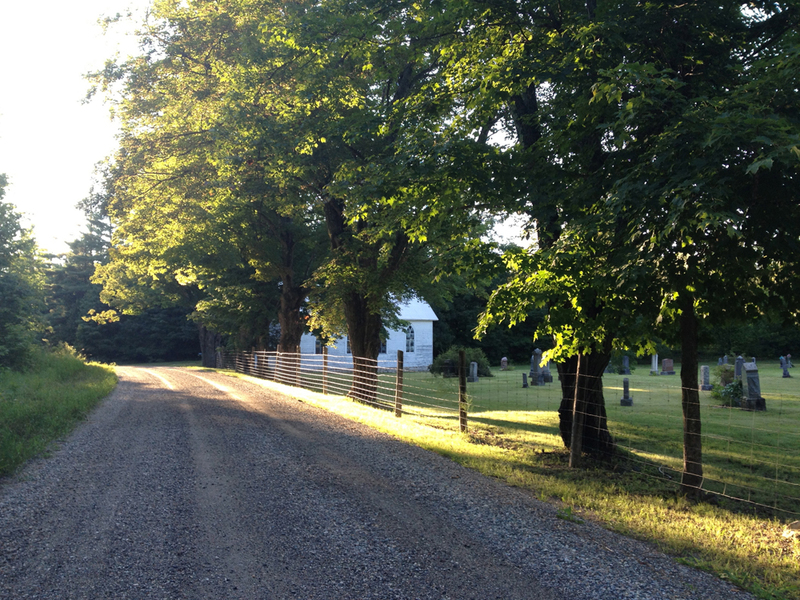 And voila – Hunter Side Road! 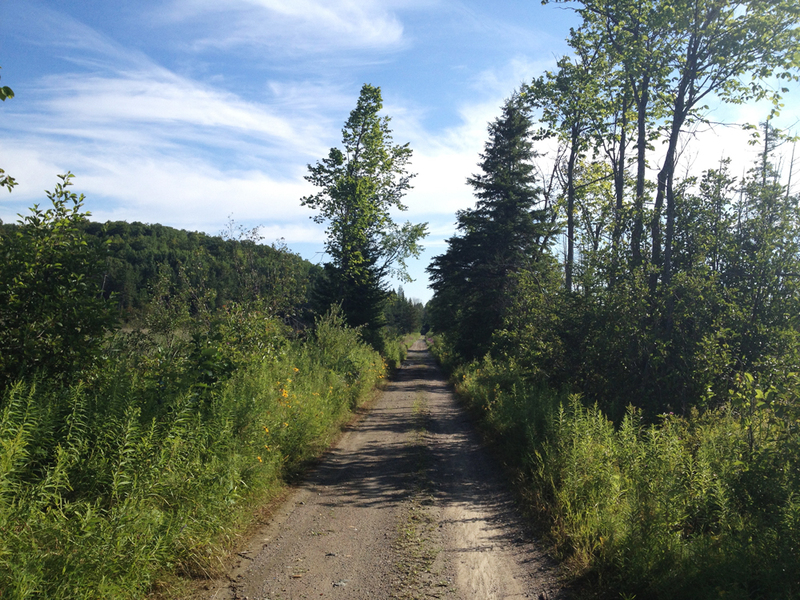 I turned onto Bennett Lake Road, which is the perfect country road to bike along – very little traffic, and the few vehicules that did overtake me slowed right down and gave me lots of room. 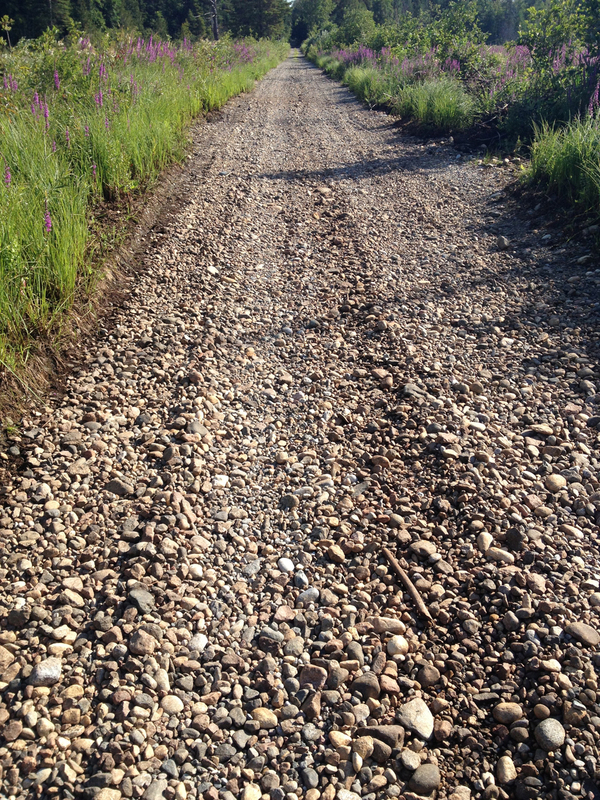 After crossing Elphin-Maberley Road, Bennett Lake Road became 11th Line Road, surfaced in a light coloured packed gravel excellent for biking. 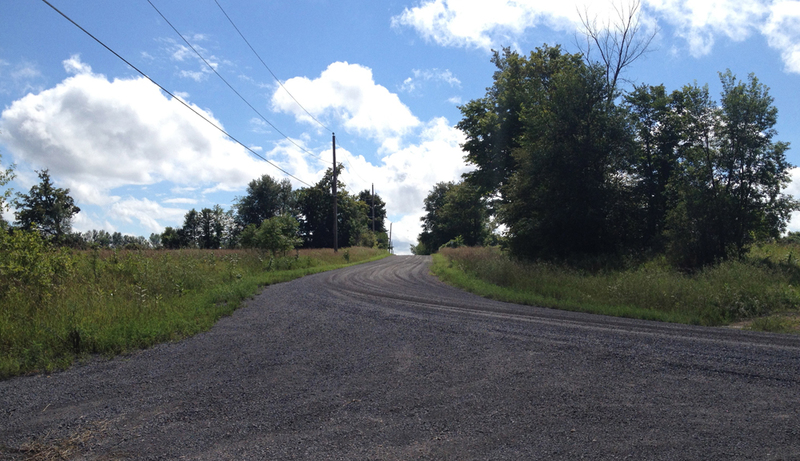 11th Line joins Zealand Road which is paved and just as great as Bennett Lake Road. Turned onto Bell Line Road, which is a brown gravel surface, that alternates between packed and loose, still very good for biking. 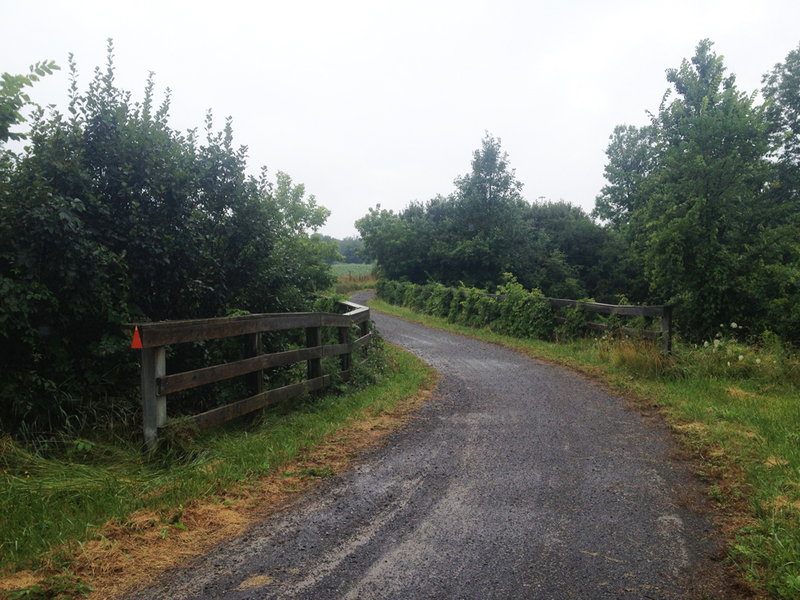 Next turn will be onto the K&P Trail which crosses Bell Line Road. There isn’t a sign indicating where the trail crosses Bell Line Road. Here’s what the intersection looks like. The trail is mostly packed dirt and gravel, like so. However there are a couple of short stretches where they’ve put down some stones for draining which may require dismounting and walking your bike. 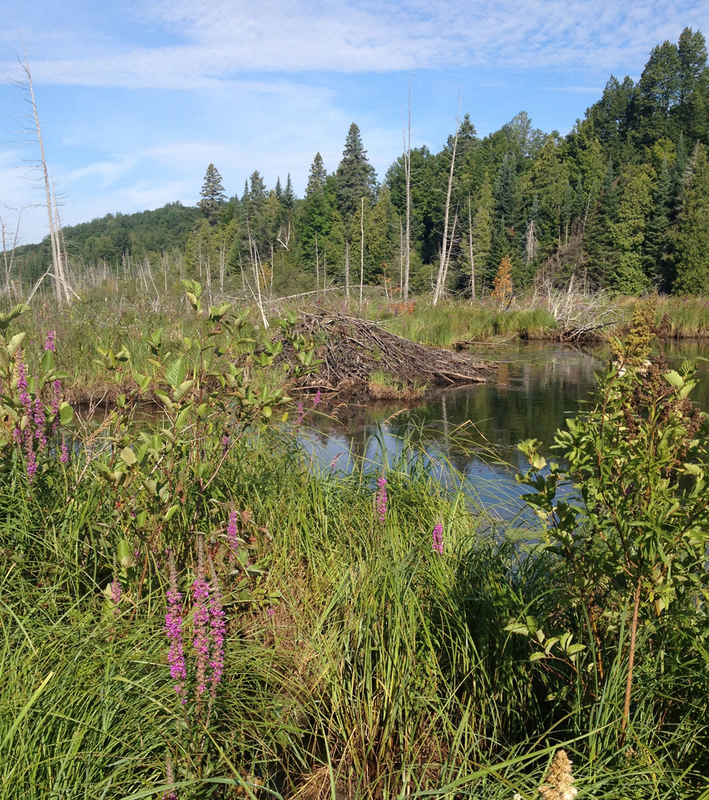 There’s a beaver house just off the trail along one of these stretches. 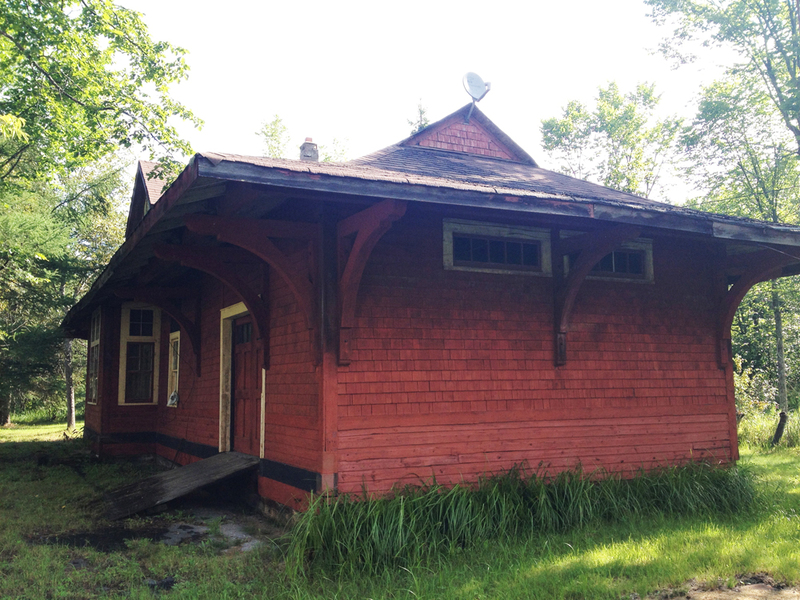 The trail crosses Clarendon Road, which you will know you’ve reached by the abandoned station house on the opposite side of the road. Follow Clarendon Road for a short bit to get to the entrance of the festival site. It’s hilly and narrow so watch out for cars heading to the festival. Et voila! Time for Blue Skies.